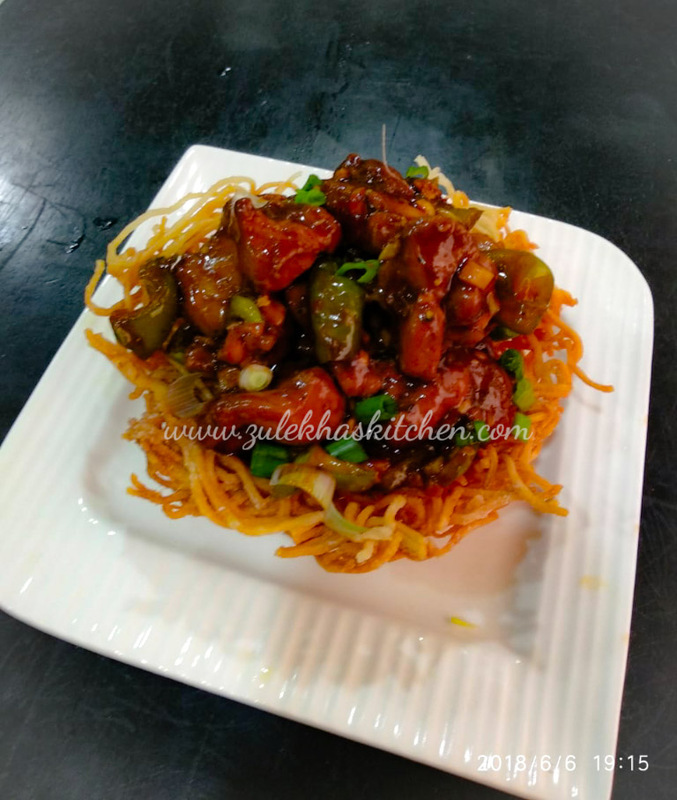 Chicken Sizzlers or Chicken Schezwan Sizzlers are delectable which are not only super tempting but delicious too at the same time. 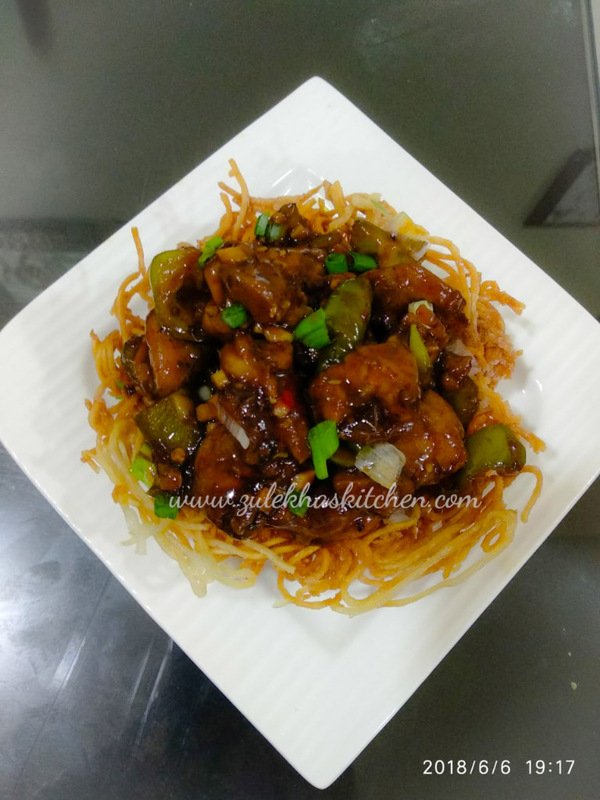 Sizzlers as we all know is served on wooden plate on which iron hot plate is kept and on that hot plate few grilled or pan sautee vegetables , french fries , hakka noddles/ fried rice is placed, lastly topped with different kind of gravies with chicken. In short it is a whole some meal on that one plate. 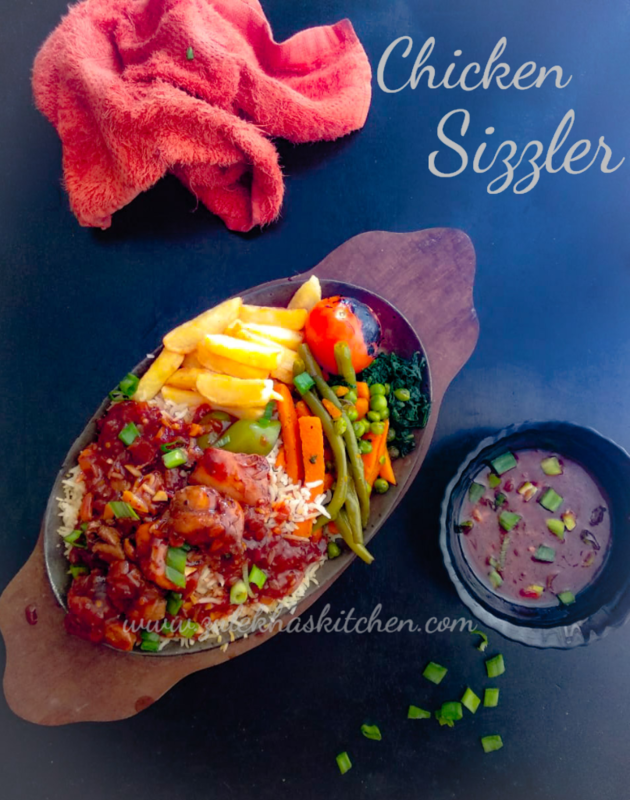 Sizzlers are of many kinds and prepared , served in different ways, some serve with mashed potatoes instead of french fries and some serve with cheese slices. 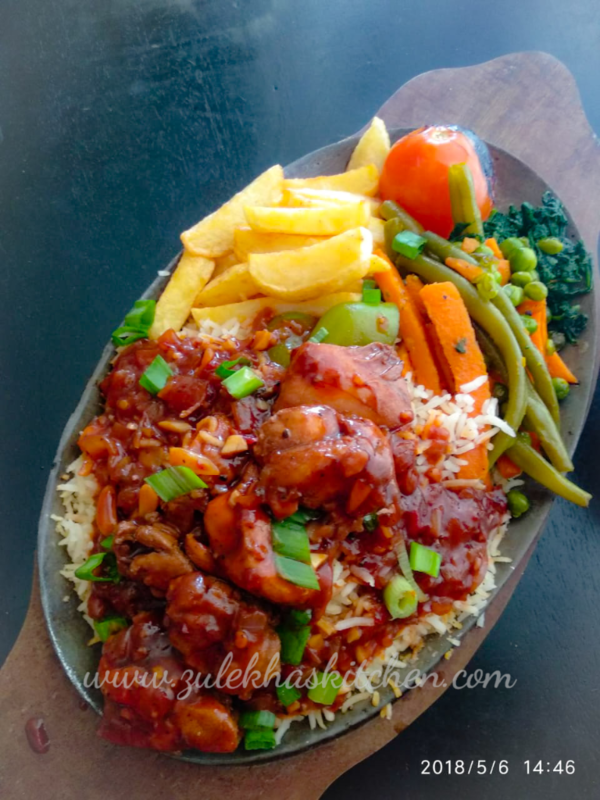 In fact you can prepare different types of gravies every time you make Chicken sizzlers, You can even replace or skip vegetables as per your choice. Though the iron plate is used as a medium to serve which keeps the food hot for a long time as the plate is of iron. Well in this recipe of mine, I did not add cornflour and made the gravy of the sauces it self, trust me that is the best part of this recipe. 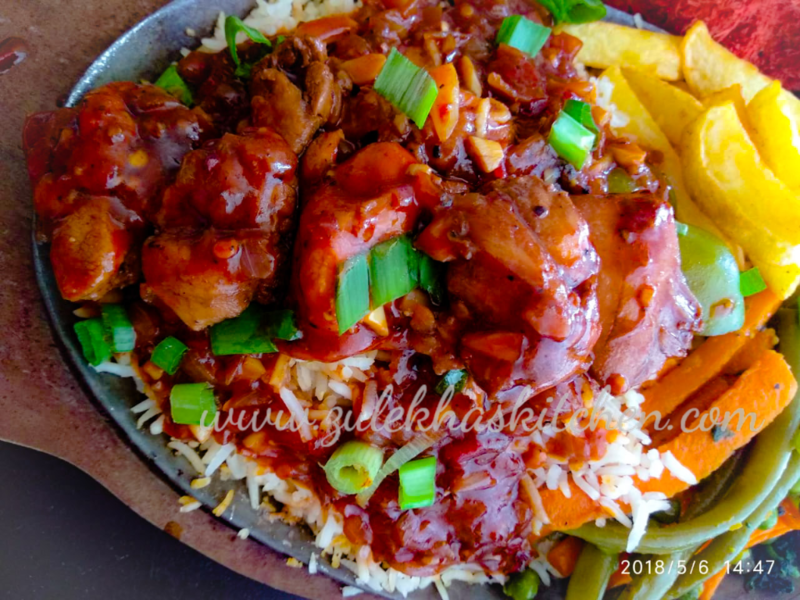 Here is my recipe of Chicken sizzlers/ Chicken Schezwan Sizzlers. 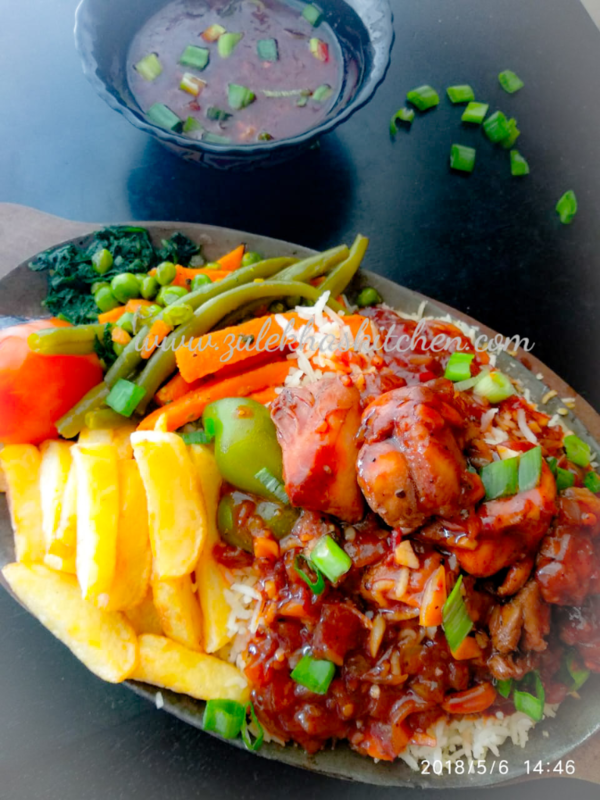 Clean, wash and chop chicken boneless into thick cubes and marinate it for 3-4 hours or night before with all the ingredients mentioned under " MARINATION " section. Clean, wash and chop few spinach leaves into thick pieces and fry them in a non stick pan by adding 1 tbsp butter and salt until it is done. Transfer in a dish and keep aside. 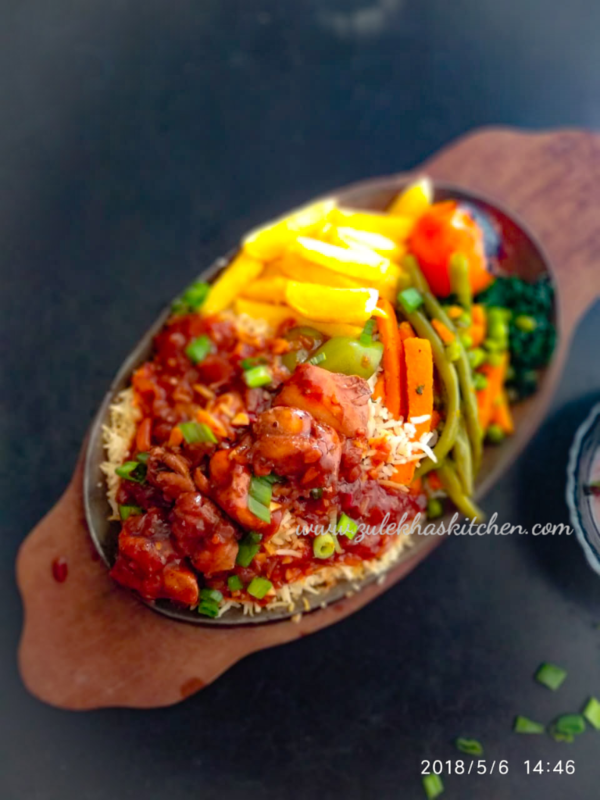 In a non stick pan, heat 2-3 tbsp oil / butter and stir fry marinated chicken on high flame till all the water dries up and the chicken is completely done. Transfer the chicken pieces in a dish and keep aside. Now prepare the sauce, In the same pan drizzle some oil and add finely chopped garlic, fry for a minute ( make sure it does not change the colour ). Add chopped onions, fry till they turn translucent. Now add pepper powder, tomato sauce, vinegar, Worcestershire sauce, soya sauce, red chilly sauce, schezwan sauce, green chilly and chicken stalk/water . Adjust the seasonings, add green, red, yellow bell pepper and saute for 4-5 minutes and off the gas. Grill a medium sized tomato and peel, chop potatoes into french fries, apply salt and cornflour and deep fry them in hot oil until crispy and done. Drain on an absorbent paper. 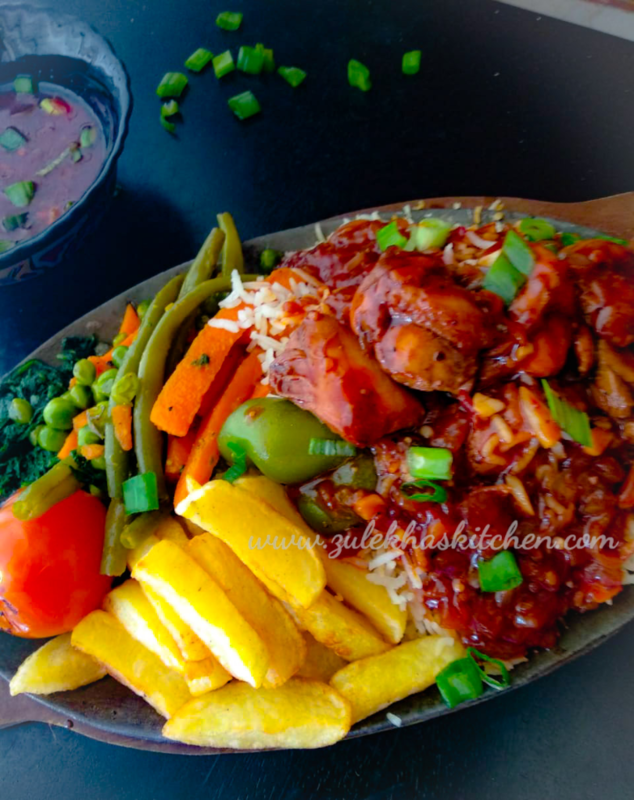 By now all the things are ready like chicken with gravy, french fries, saute vegetables, french fries, flavored rice. Now prepare flavored Rice with the help of link given below. 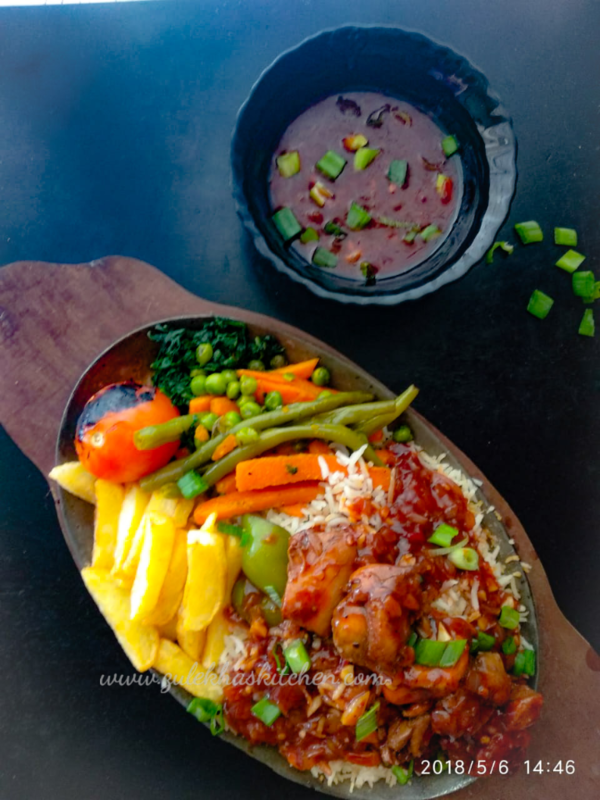 Heat the sizzlers plate till it is very hot, now carefully place it on the wooden plate . Add 2 tbsp butter and place single sheet of cabbage all over the plate. 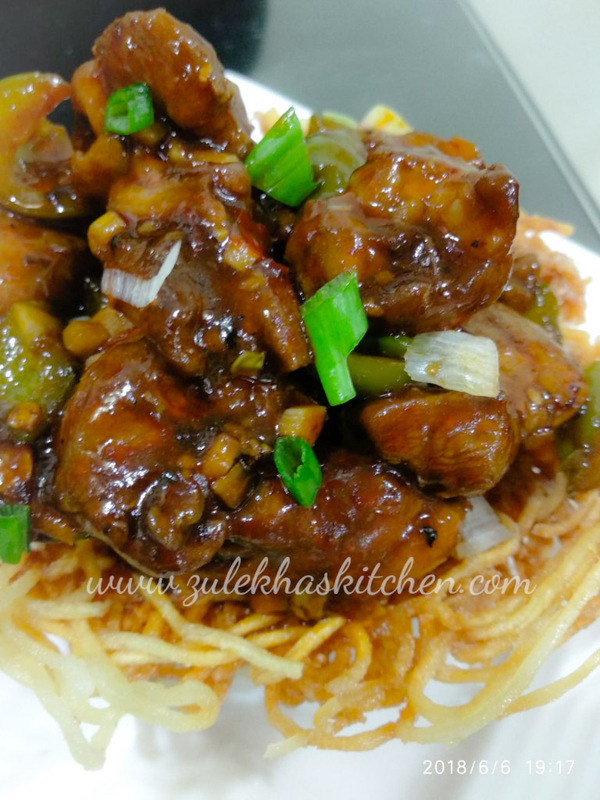 On one side place stir fired hakka noddles/ hakka noodles/flavored rice or fried rice . On the other end place whole grilled tomato , next to it place all the butter sauteed vegetables one by one like spinach, long thin stripped carrots and french beans, green peas and french fries. Pour over the saucy chicken and lastly pour the sauce and place a cheese slice ( optional ). Adjust red chilly sauce, green chilly sauce, schezwan sauce and rest of the sauces as per your preferences. 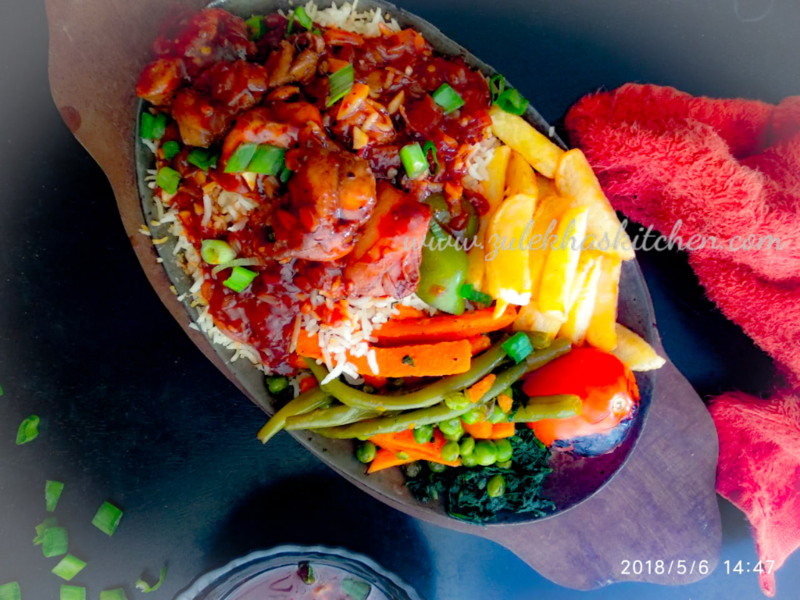 In fact I made flavored rice but you can prepare fried rice too. 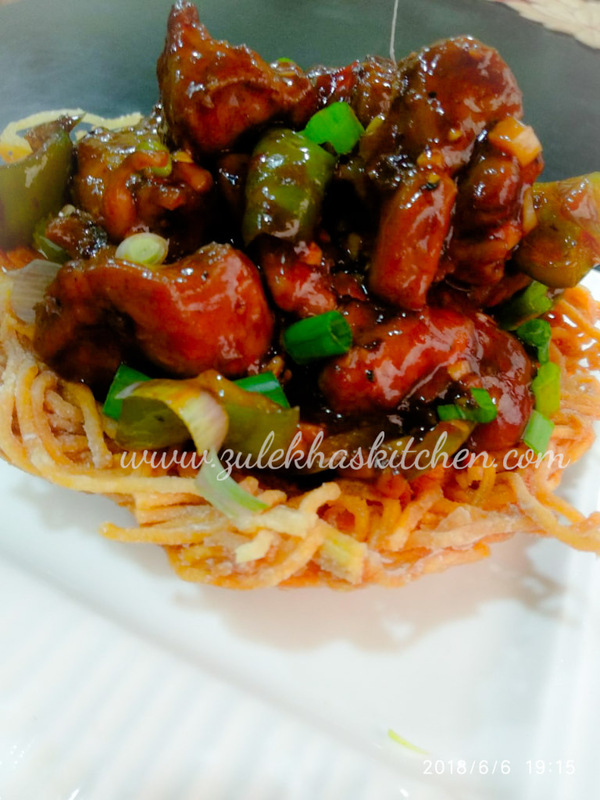 You can replace flavored rice with veg hakka noodles or pan fried noodles. 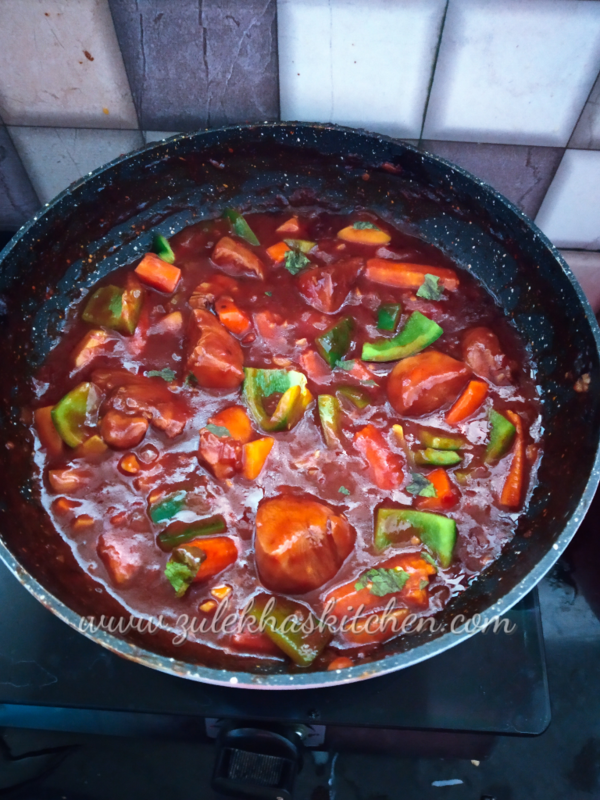 In fact you can add thick chopped bell peppers green, red, yellow into the gravy itself and not stir fry it with other vegetables. You can even prepare separate gravy for kids, just that do not add red chilly sauce, green chilly sauce and schezwan sauce. You can add ajinomoto too instead of salt but I did not add it as it is not good for health. You can skip or add more vegetables of your choice like cauliflower florets ,red and yellow bell peppers, zucchini or broccoli florets. TOTAL TIME: 1 Hour & 15 Minutes. 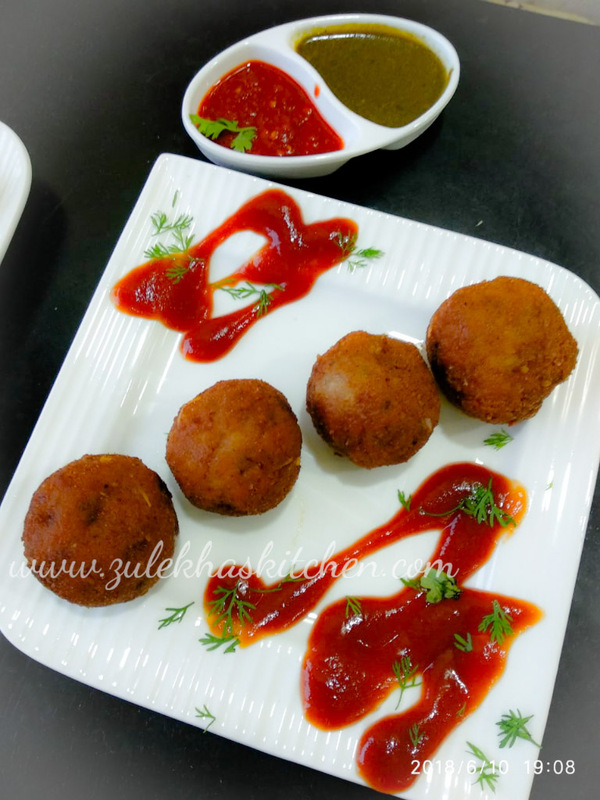 Chicken Cheese Balls is a delectable appetizer, an apt one for kids , in fact you can serve to your guests too. 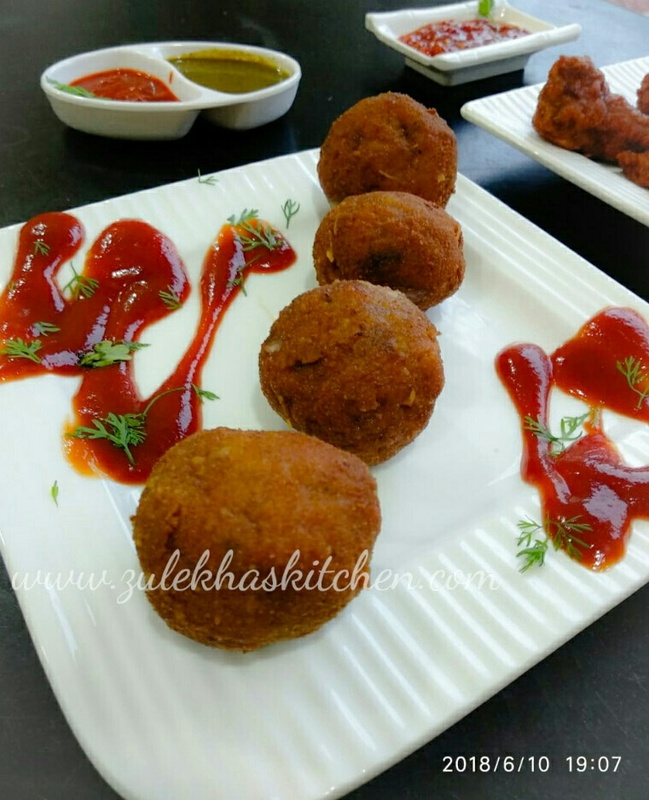 Actually few years back when I had made smokey chicken cheese balls , that time many people requested me to put up the same but something in deep fried as smokey chicken cheese balls were made in app pan by me where as they did not have an appe pan. 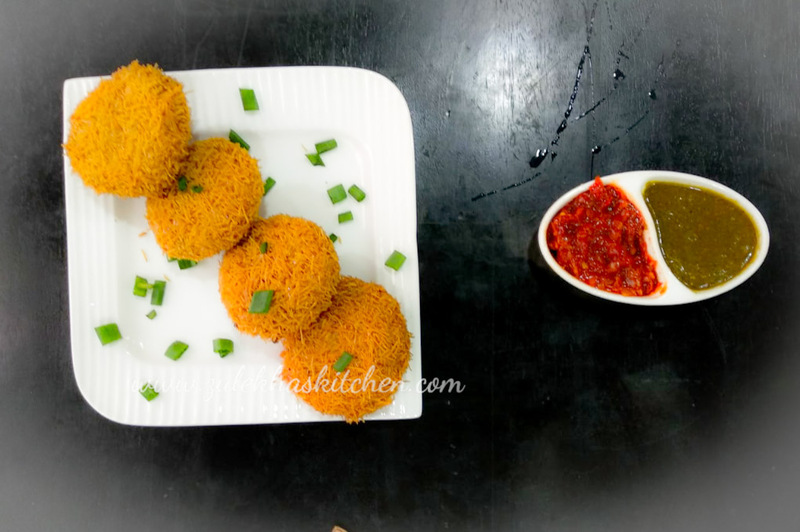 So here is my cheesy crispy chicken cheese balls recipe for all of them ...! In a large bowl add , chicken mince (pulsed into fine in food processor ) salt , pepper powder , ginger garlic paste, paprika powder, mixed herbs, chilly flakes, cornflour, coriander leaves , egg yolk( preserve white for later use), crushed green chillies , mix everything well . Add butter and mix well and keep aside for half an hour for marination. 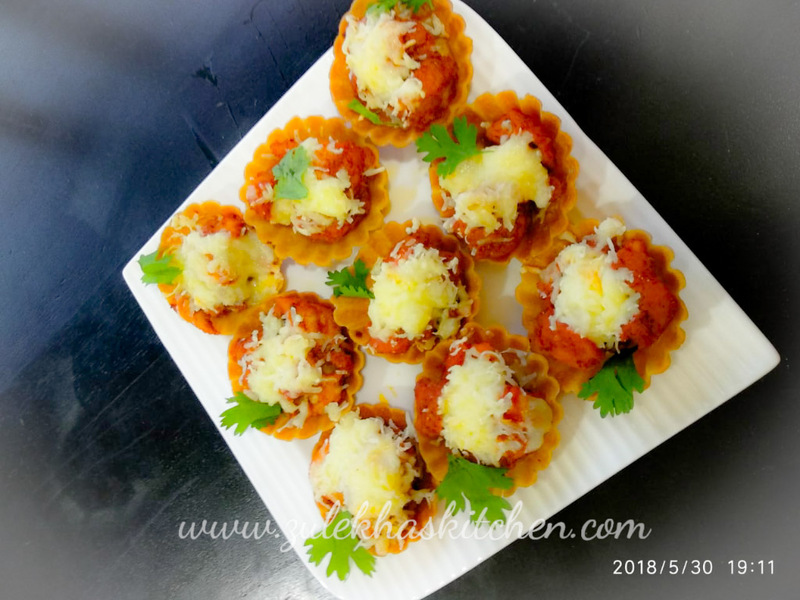 Now apply little oil in your palms, take a small amount of chicken mixture and roll into a ball , now flatten it and keep a cheese cube in between , cover it and make a shape of ball. 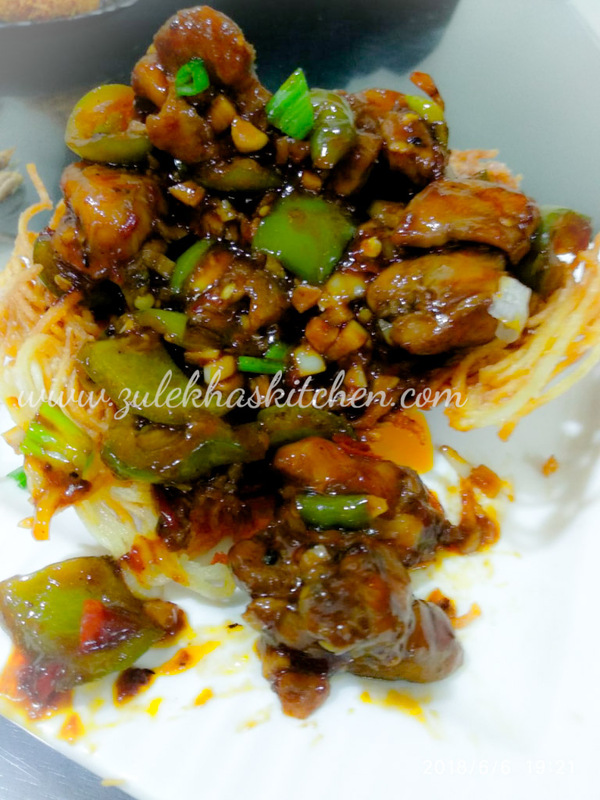 Repeat the process and make such balls with the remaining chicken mixture. Side by side heat oil in a deep pan or kadhai , slow down the gas once the oil is hot. Now roll each chicken cheese balls in all purpose flour then in egg white and lastly in bread crumbs . Repeat the same procedure with all the chicken balls and now place few at a time in hot oil and deep fry until they turn crisp and golden in colour. Drain on an absorbent paper and fry the other remaining chicken cheese balls in batches . Serve hot with ketch up or any king of chutneys. Increase or decrease the amount of green chillies as per your taste. Increase or decrease the amount of paprika powder and other seasonings as per your taste. PREPARATION TIME : 15 Minutes. COOKING TIME : 15-20 Minutes. 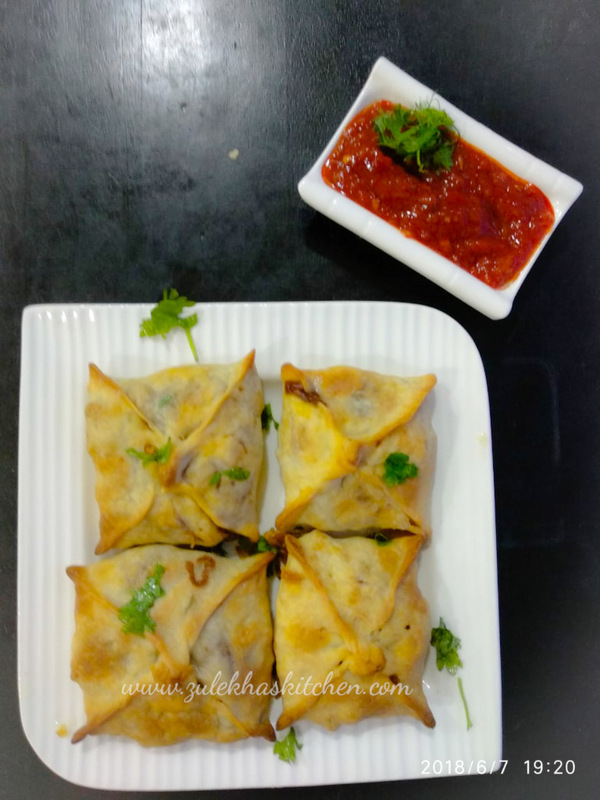 Chicken Chinese Samosa / Chicken Chinese Samosa squares are delicious and tempting appetizer served with chutneys or your choice of sauce. 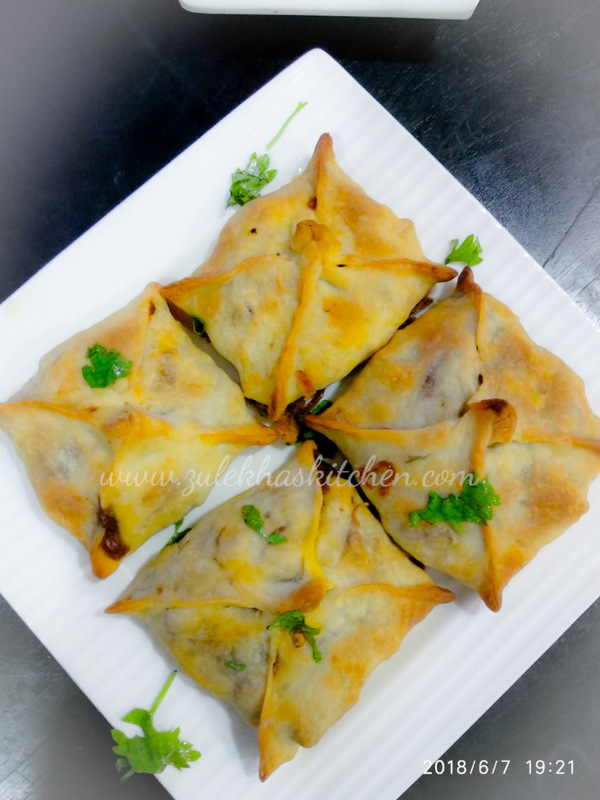 I have made the wraps at home and changed the shape and have named these chicken chinese samosas to Chicken Chinese samosa squares, but if you want you can add the same filling into our regular samosa pattis and serve with chutneys or sauces. 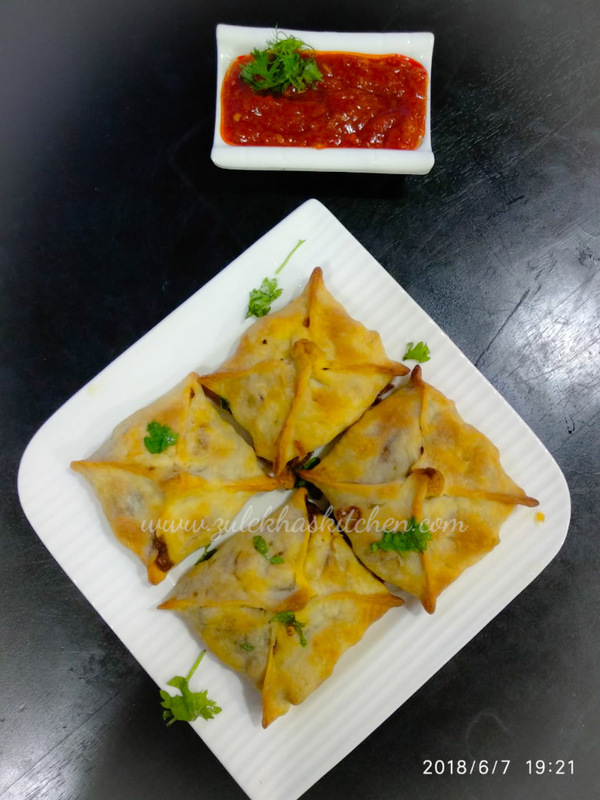 Here is my recipe of Chicken Chinese Samosa / Chicken Chinese Samosa squares. Wash chicken , clean and cook with salt, water and ginger garlic paste till its completely done, remove from flame , cool and shred it , keep aside . Knead the flour ( maida) with salt and ghee /oil , now add desired water and knead again into semi soft dough, keep aside by covering it with wet cloth over it . In a pan heat 2 tbsp oil add crushed garlic and green chilies , saute for a while now add french beans and fry for sometime till its partially cooked , now add all the other vegetables and saute for a minute by adding salt , pepper , soya sauce , boiled hakka noodles, vinegar, red chili sauce , red chili powder and shredded chicken. 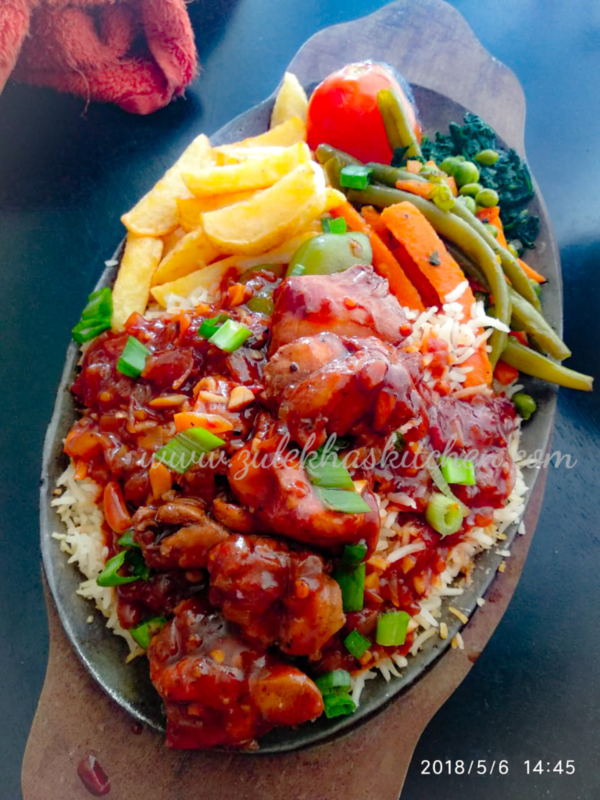 Add cornflour diluted in water and cook on high flame until the gravy thickens , adjust the sauces , salt , pepper and other spices . Remove from fire and keep aside. Now take the dough and roll into 5 " rotis , ( not too thick nor too thin ). Chop of the edges with the help of knife and make a square . 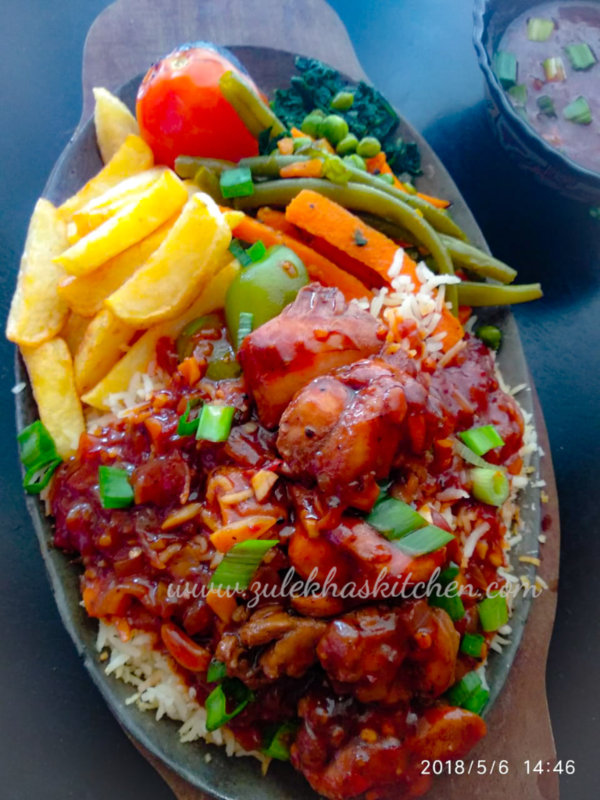 Place the chicken mixture in middle of the wraps and now pick each edge, one by one collecting all four in the middle and pinch it tightly with the help of your finger tip. Join all the open edges with the help of your fingers by pinching it . 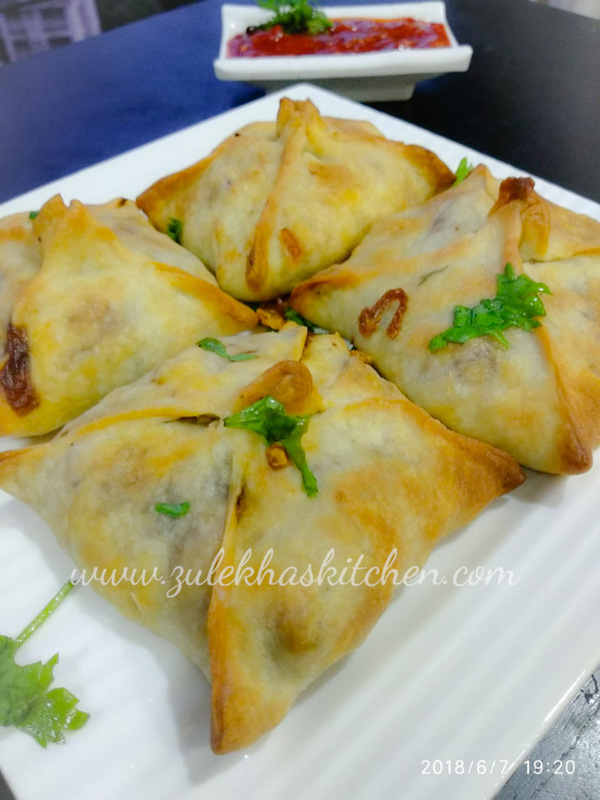 Heat oil in deep pan, place each chicken chinese samosa square and fry until crisp and golden. 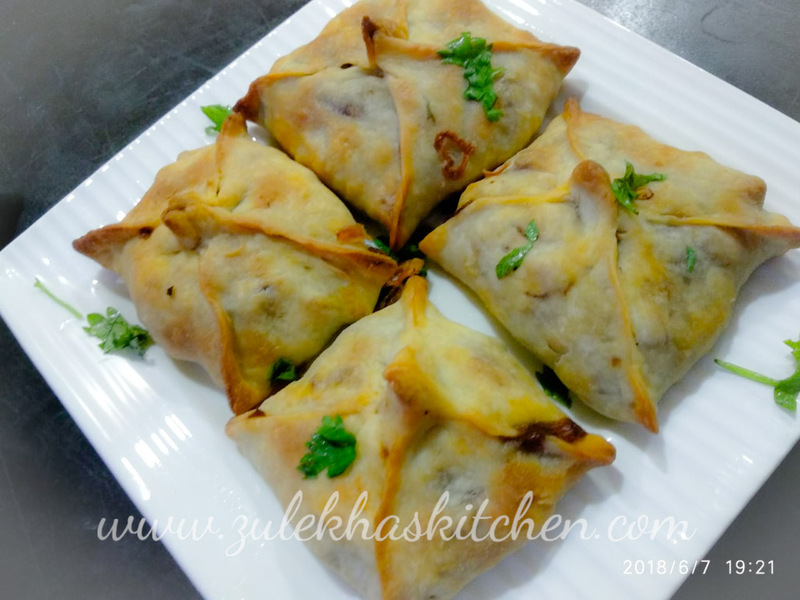 For veg Chinese samosa squares, do not add chicken , rest procedure is same. If you want more spicy add red chili sauce as per your taste. I tried making both the ways , baking it and deep frying it but my personal favorite shall remain the deep fried ones. 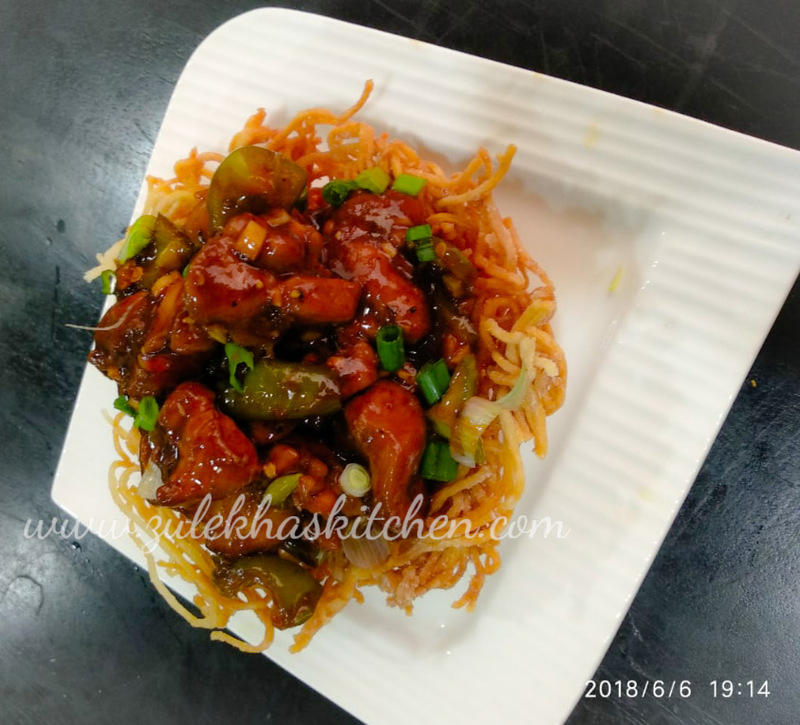 If you do not want to add boiled hakka noodles, skip it. If you do not want to make a thick saucy vegetable mixture , then skip the step of adding the diluted cornflour, rest follow the procedure. PREPARATION TIME: Approximately 60 Minutes. 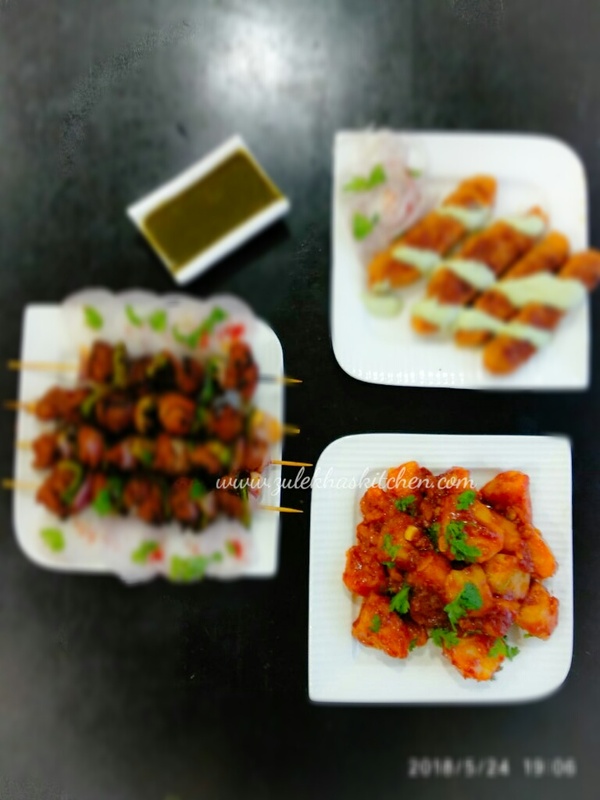 Chana Batata is a street side chatpata Indian snack. 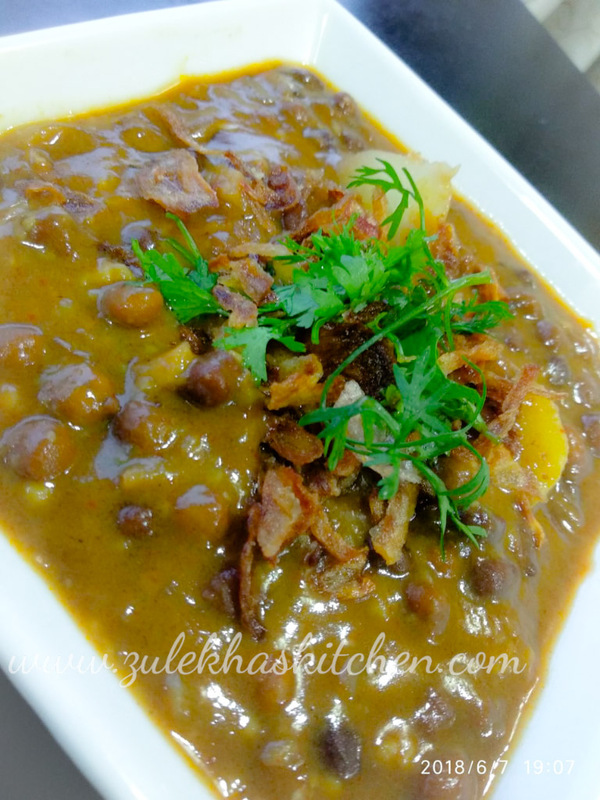 Chana batata is made of boiled chickpeas simmered in spicy/mild spicy tamarind thick gravy. It is one of the most favorable street side snack loved by all. 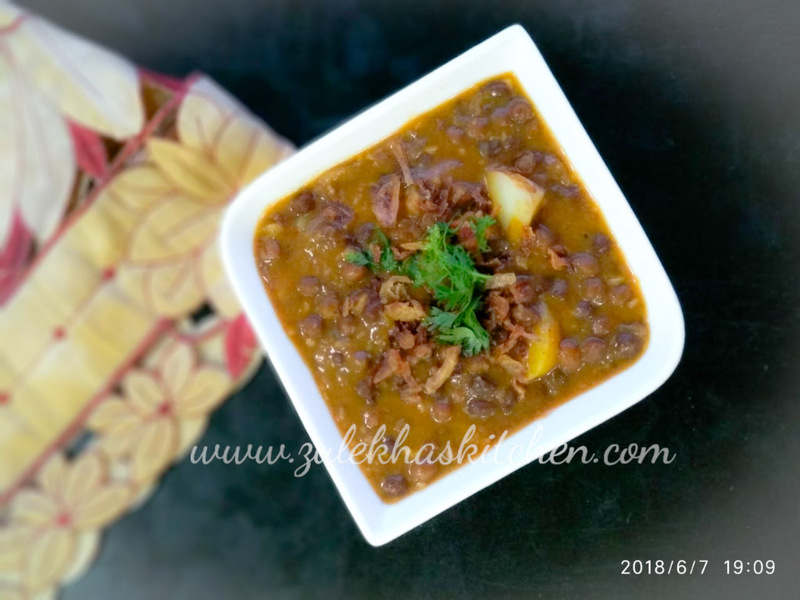 I have been making this kind of chana batata since past 15 -17 years now, but never got the chance to put up on my blog. 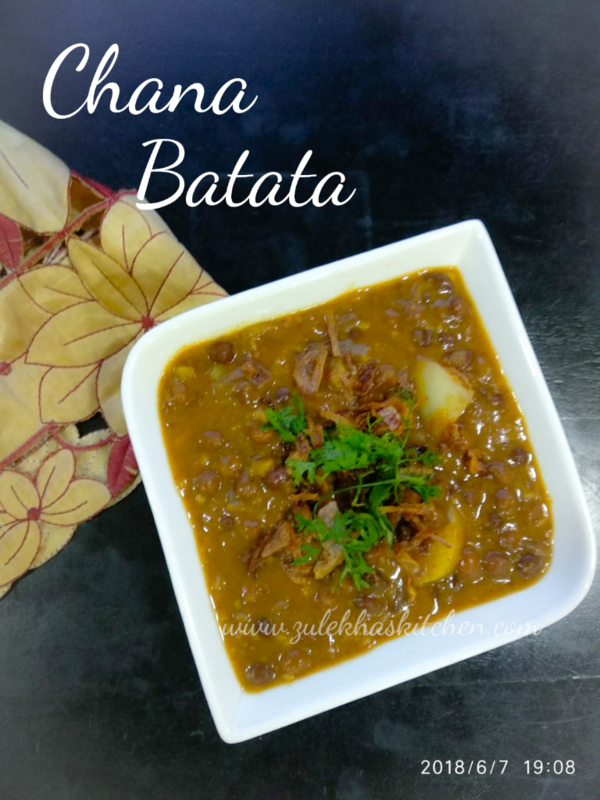 Infact whenever I make chana batatas and post on any of FB groups ( social networking site ) , I get many request to put up the recipe. Well since then I am struggling to draft this recipe last 2 years, but some how I could not. Today I felt I have to draft the recipe for sure. 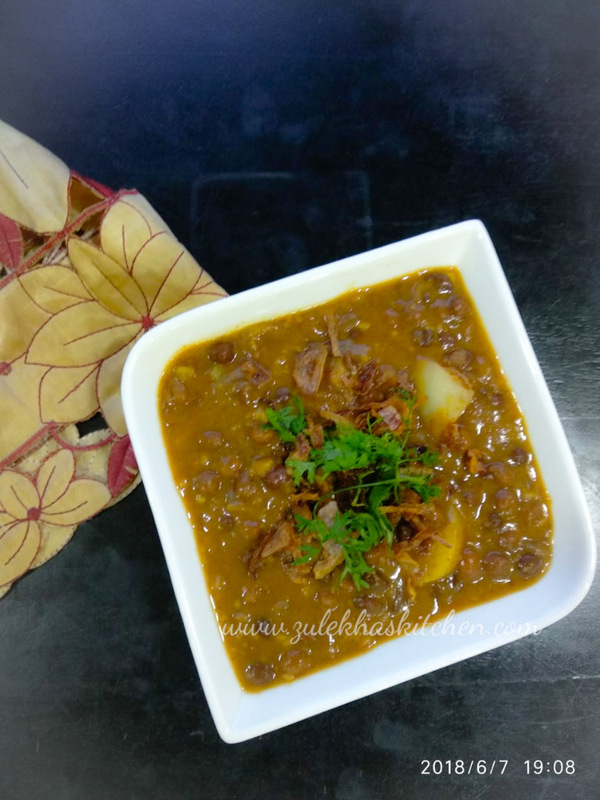 So here is my recipe of Chana Batata. 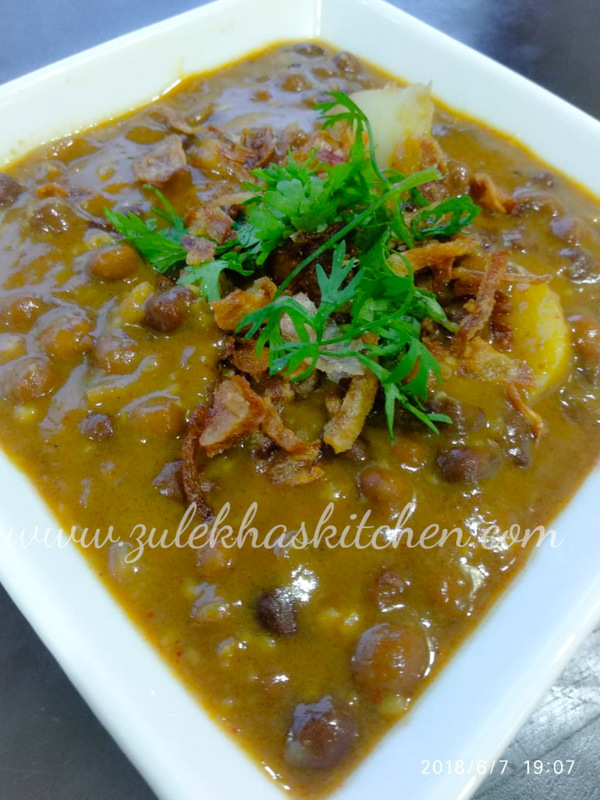 Soak brown chana over night in a vessel with few cups of water . Next day in cooker add drained chana with 3-4 cups cooking water with salt. Cook and make 3-4 whistles on high . Slow down the gas and let it make 3-4 more whistles. Off the gas and once cool , check if the chana is completely done. Side by side, crush garlic and chilies in a motar pestle. In a deep pan , drizzle some oil , add curry leaves and sliced onions . Fry until golden brown in colour , add chana , turmeric powder and red chilly powder and fry for a minute . Add crushed garlic and green chillies and mix well , fry for a minute or so. Side by side dilute gram flour in 1/4 cup water , mix well . Bring to boil and add gram flour mixture in chana. Now add potatoes , mix well and cook until gravy thickens. 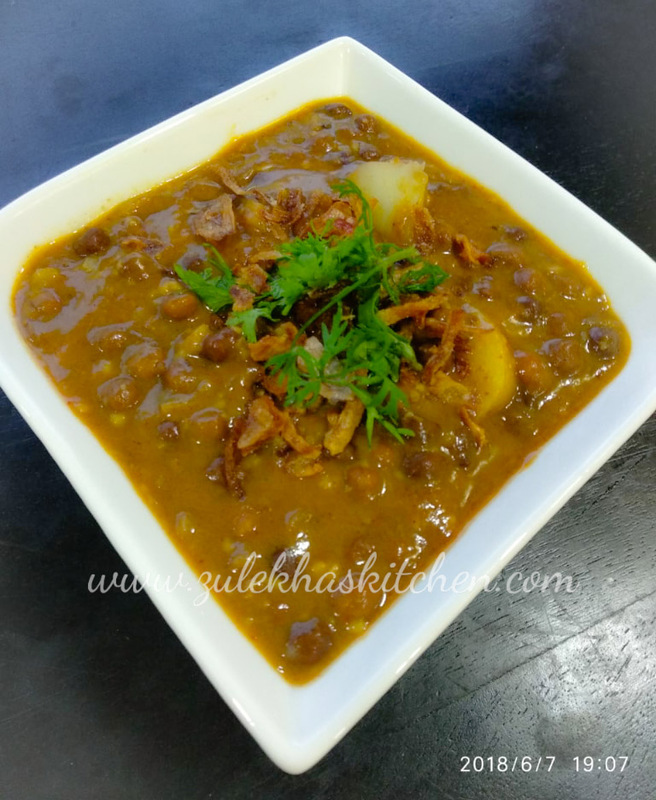 Transfer in a serving bowl, garnish with some coriander leaves and fried brown onions, serve hot. You can increase or decrease the no of garlic and green chillies as per your taste. Adjust the tamarind pulp as per your taste . If you want to add more green chilies and do not want to add red chilly powder then do not add it. PREPARATION TIME : 30 Minutes. 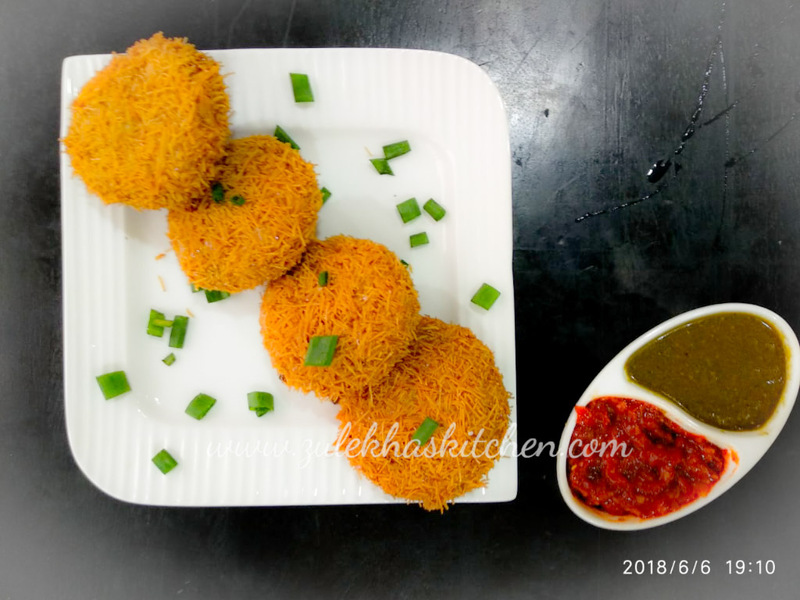 Creamy Noodles Kabbabs / Noodles kabbabs are lip smacking and delicious snacks served with mint coriander chutney or red chilly chutney or schezwan chutney . 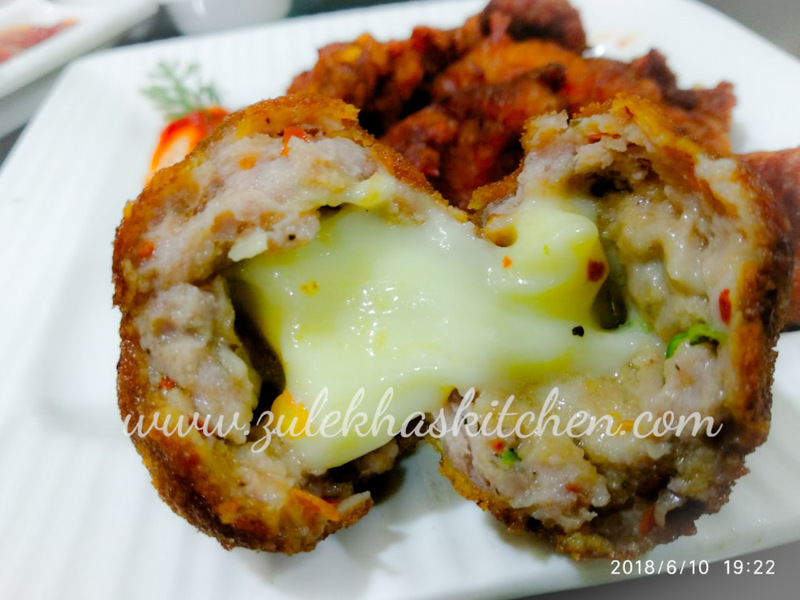 These delectable kabbabs are loved by all age groups as it's creamy texture makes it so delicious. 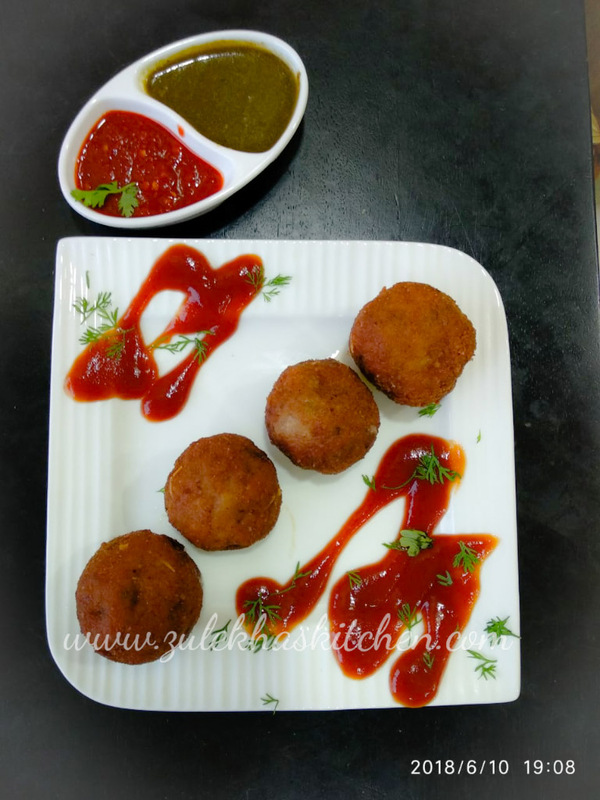 Here is the recipe of Creamy Noodles Kabbabs / Noodles kabbabs. Boil chicken with ginger garlic paste and salt , once done shred the chicken and keep aside . Boil separately water with some salt and 1 tbsp soya sauce , add 1/4 packet hakka noodles roughly crushed , boil until al dente , drain and keep aside . Whisk 1 eggs with 1 tbsp water and salt , until fluffy and keep aside. Now prepare white sauce , in a sauce pan heat butter and add all purpose flour ( maida ) and saute for a couple of minutes . Gradually add milk , stirring it to avoid lumps , now add salt , 1/8 tsp pepper , mix well . Remove the pan from heat . Let the sauce come to room temperature. grated cheese ( optional ) , mayonnaise, coriander leaves and white sauce , mix everything well . ( do not panic , in this step the mixture would be sticky and a bit thick saucy type ) NOTE : Here in this step if you think that you will not able to handle sticky and saucy mixture , then just refrigerate the chicken mixture for about an hour and then once the mixture gets body to it , shape them and dip in egg wash and then roll in breadcrumbs . 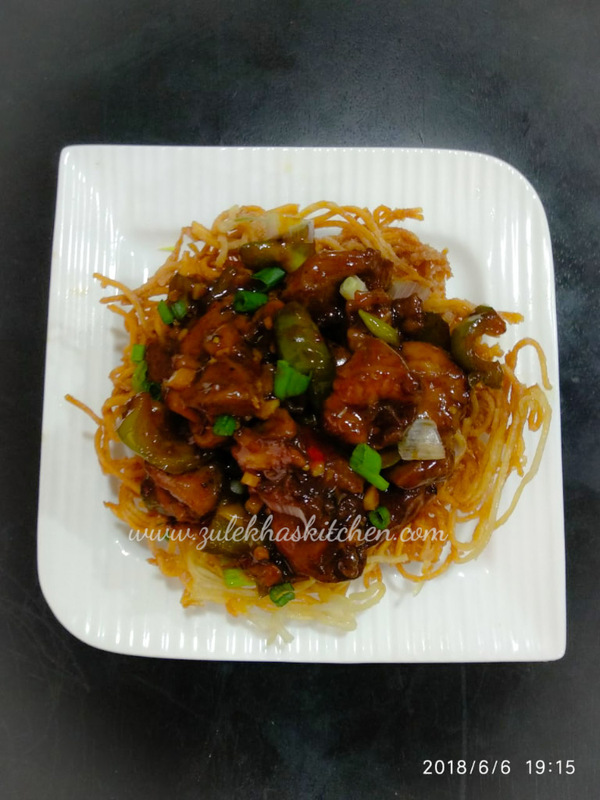 Take a medium sized chicken noodles mixture and shape it into a flat medium or large round size patty. Make rest of the patty with the remaining mixture. 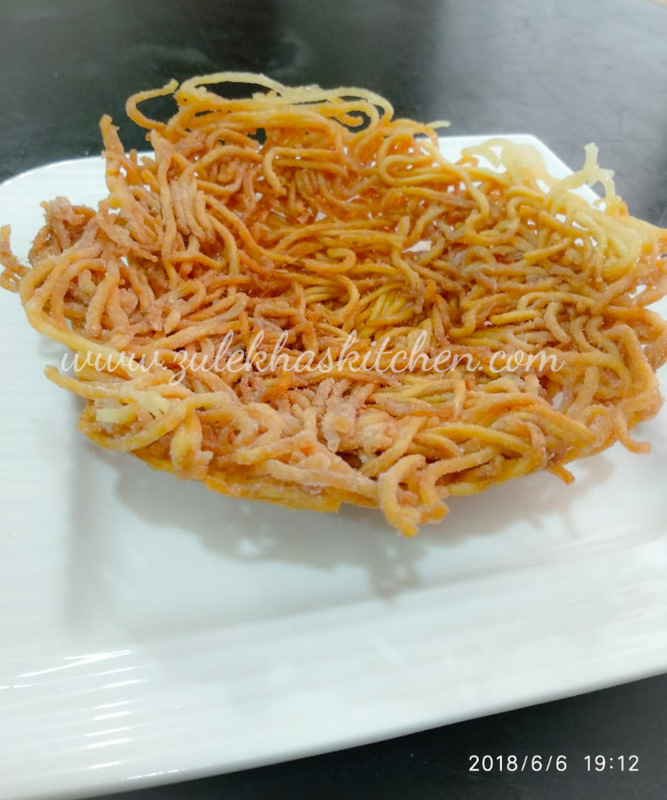 In a kadhai heat sufficient oil , now dip each flat disc in egg wash and then roll in cornflakes and breadcrumb mixture or roughly crushed seviyan , shallow fry them in batches until golden brown . 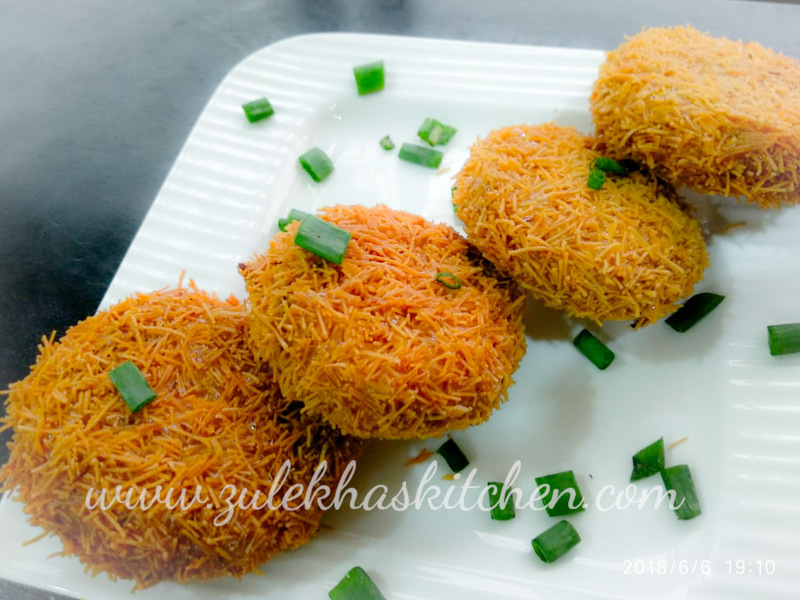 You can either roll in crushed roasted seviyan ( vermicelli ) or in crushed cornflake bread crumbs mixture. 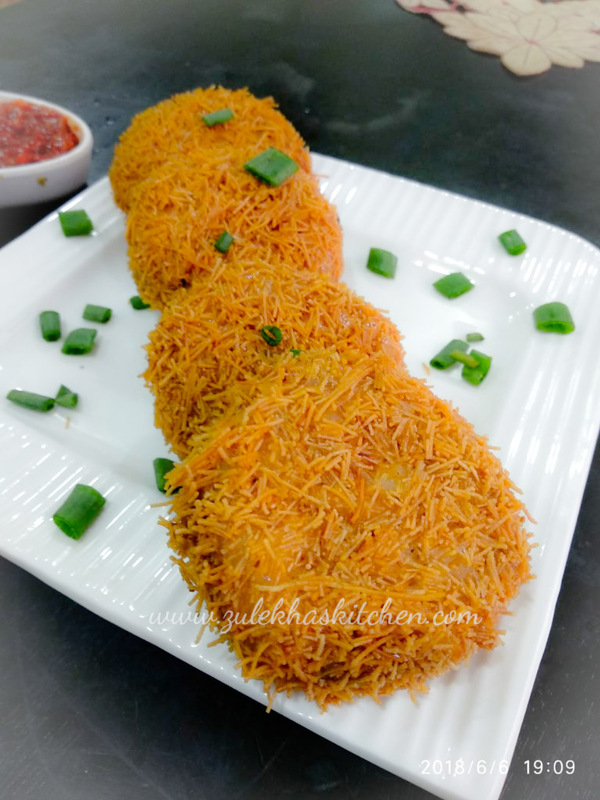 You can even roll in just bread crumbs and fry. Increase or decrease number of green chillies depending on your preferences. 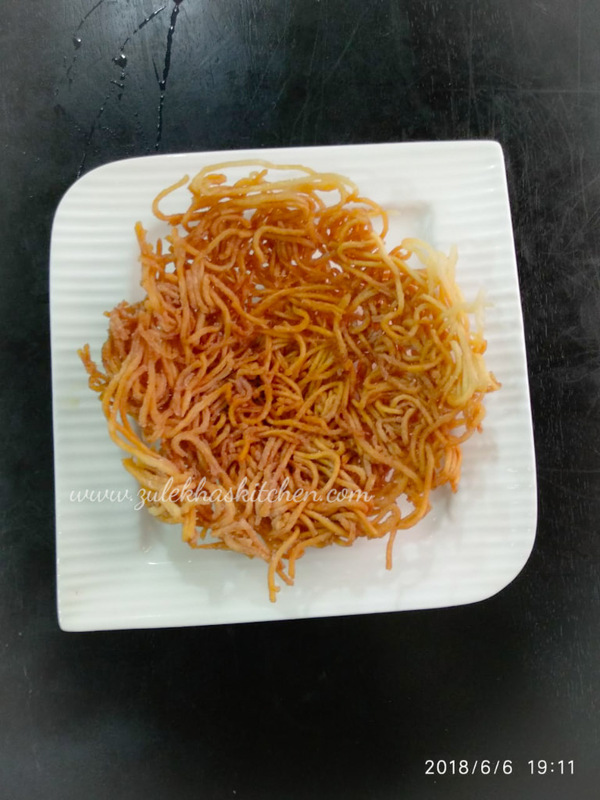 If you feel the mixture after adding the white prepared sauce is too sticky and you are not able to manage it , shape them and Refrigerate for an hour , at the time of frying remove the cutlet from refrigerator half an hour before frying , dip in egg wash , roll in vermicelli / cornflakes breadcrumbs mixture and fry them golden brown. Decrease or increase the use of pepper powder as per your preferences. PREPARATION TIME : 30 Minutes . If you like my recipes please do recommend to your many and friends . Feel free to comment in comments section below. 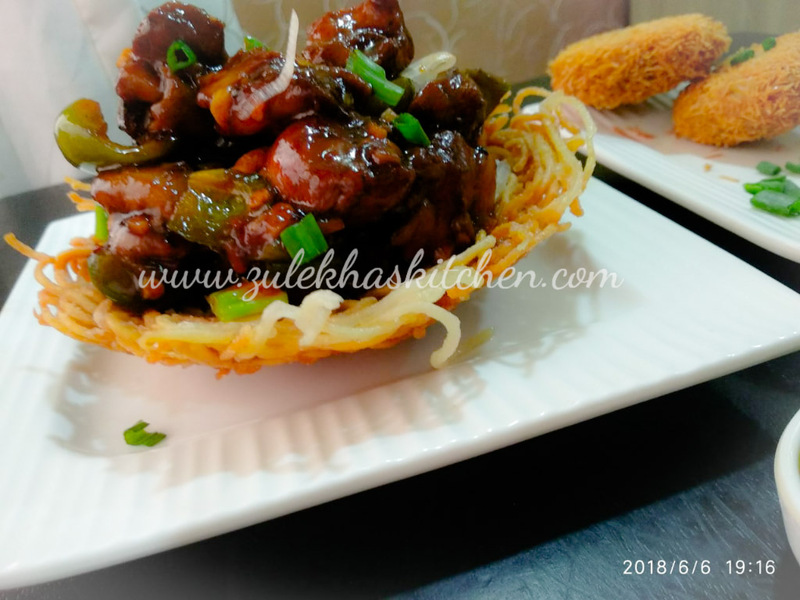 Chicken In Noodles/ Noodle Basket is a delicious appetizer in which I have prepared marinated Chicken in chinese sauces and then served in a deep fried noodles basket. 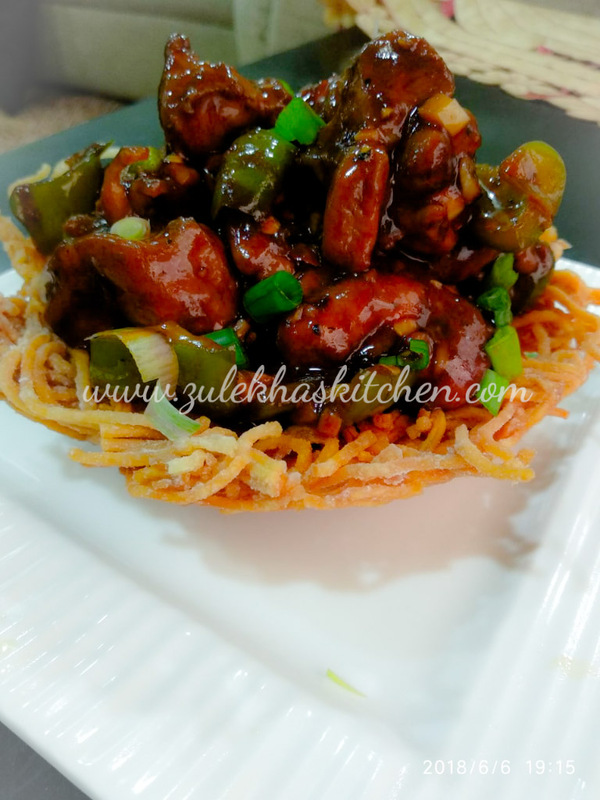 Chicken In Noodles/ Noodle Basket is a recipe to be served when you crave for something really different and tasty too . 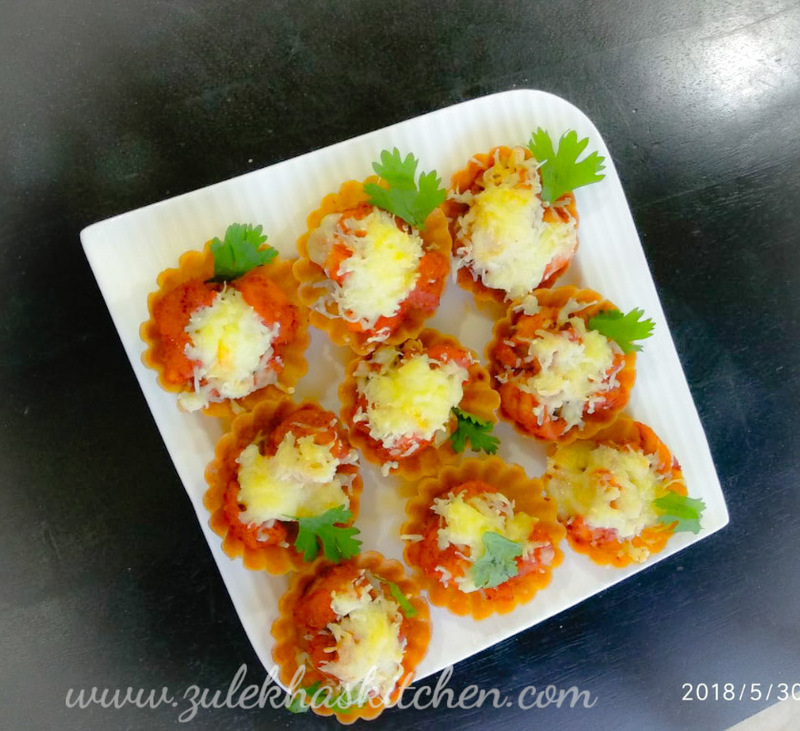 In fact the look of this appetizer is so eye appealing that you can serve to your guests too , trust me they will be pretty impressed as it not only looks impressive but is delicious and delectable too in terms of taste. 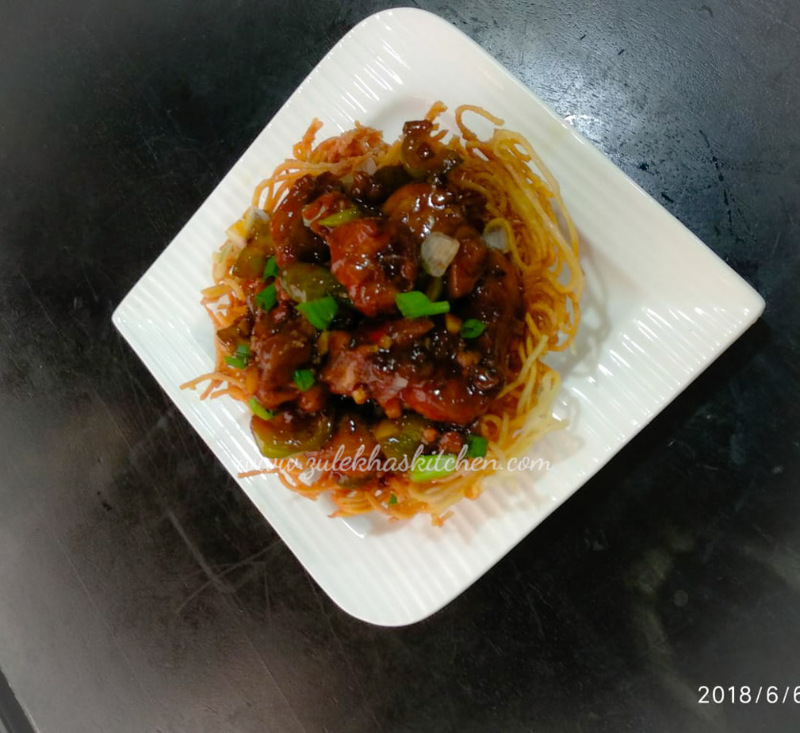 Chicken In Noodles/ Noodle Basket was first introduced to me 15-17 years back , when I was gazing a channel and there happened to show this kind of something innovative appetizer , I was so impressed that I jotted down the recipe . As I do not remember whose show it was neither did I write whose recipe it was , so it very difficult to share the name . 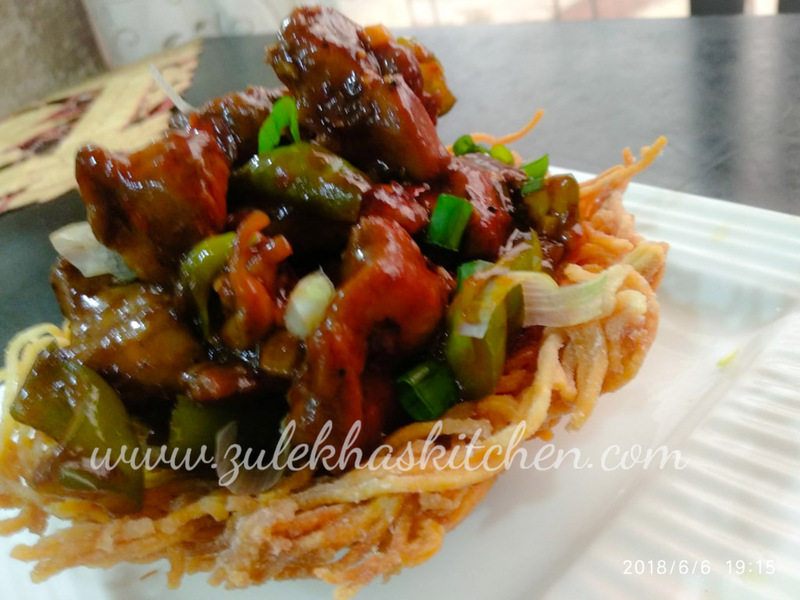 But yes the technique of making the noodle basket , I learned from there and the rest chicken starter recipe is by me . 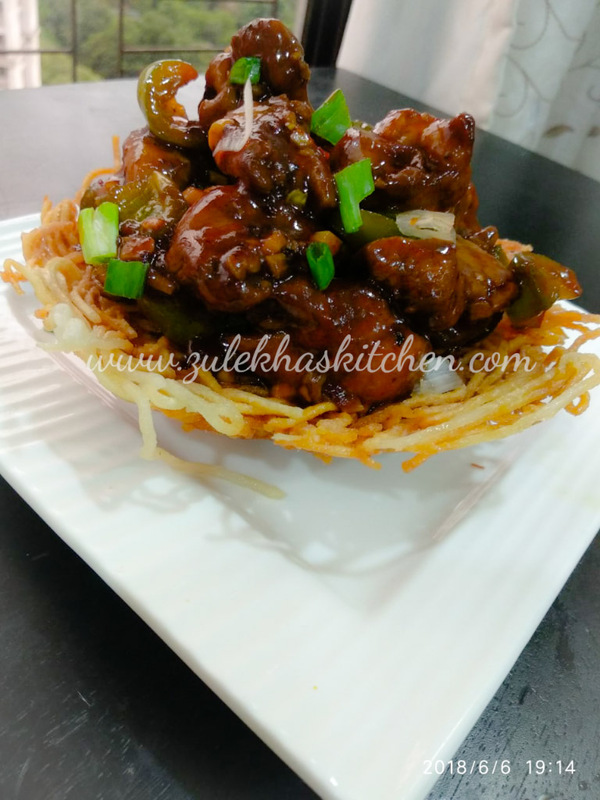 Here is my Recipe of Chicken In Noodles/ Noodle Basket. 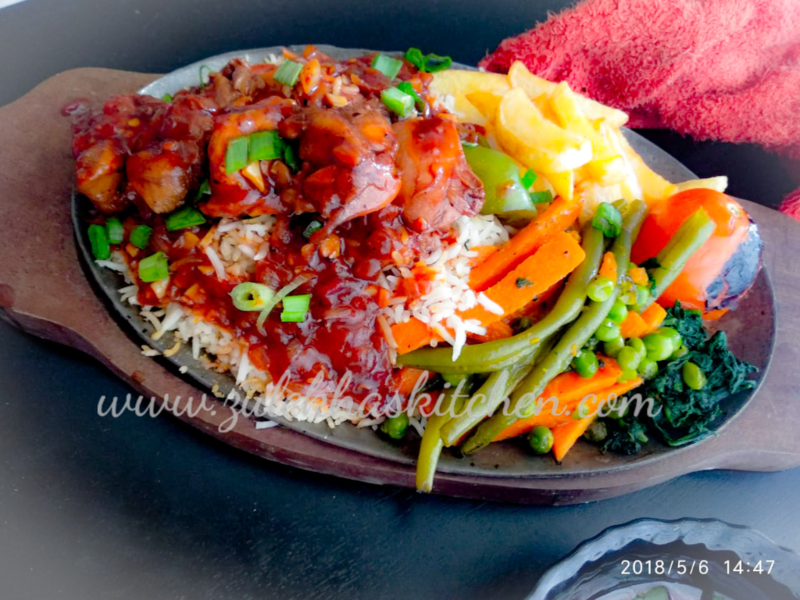 Clean , wash and chop chicken into thick pieces and marinate with the ingredients mentioned under " INGREDIENTS FOR MARINATION ' section for 1-2 hour . Boil adequate water with salt and add half packet of hakka noodles. In a non stick pan or wok , drizzle little oil or 2 tbsp butter and saute chicken on high flame until the juice has dried up . Drain and transfer into a dish and keep aside . Now in the same wok or nonstick deep pan , add little oil if needed and add chopped ginger , green chilly and garlic . Now add schezwan chutney , salt , pepper , vinegar , soya sauce , red chilly sauce , green chilly sauce , and sugar . In a small bowl , dilute cornflour in water and add to the gravy . Once the gravy starts to thickens , add chicken , broccoli and all 3 coloured bell peppers . Adjust the seasonings like salt and pepper and adjust the sauces too if needed . Mix well and once the gravy thickens , turn of the gas. Increase or decrease the amount of green chilies , chilly sauces as per your preferences. Now place another smaller spider spoon basket and place it carefully in the hot oil. Initial few minutes keep pressing the above smaller spider spoon basket to get that basket ( deep katori shape ). Fry until the noodles turn into light golden colour and is crisp. PREPARATION TIME : 20 Minutes. COOKING TIME :30 -40 Minutes. CATEGORY : Snacks / Appetizers. 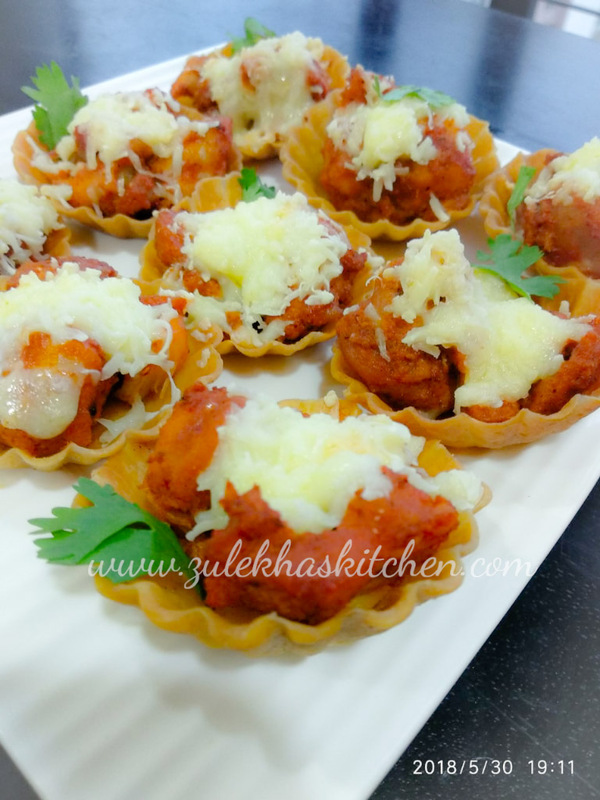 Cheesy Chicken Chaat is an easy peasy lip smacking appetizer which I created in a short time . 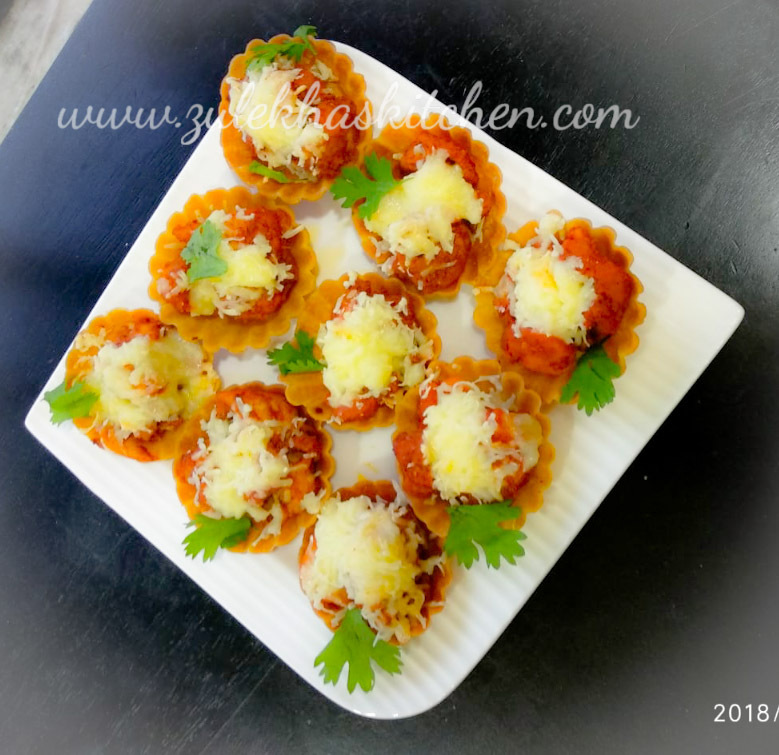 As I wanted to make something cheesy and easy too , I had these chaat baskets handy on my kitchen shelf , so made these beauties . 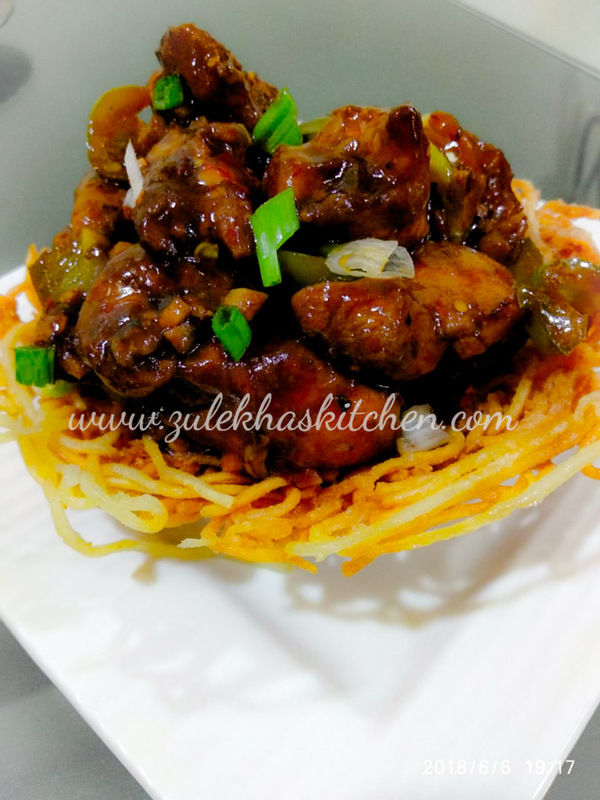 Here is my recipe of Chicken cheese chaat . 2. 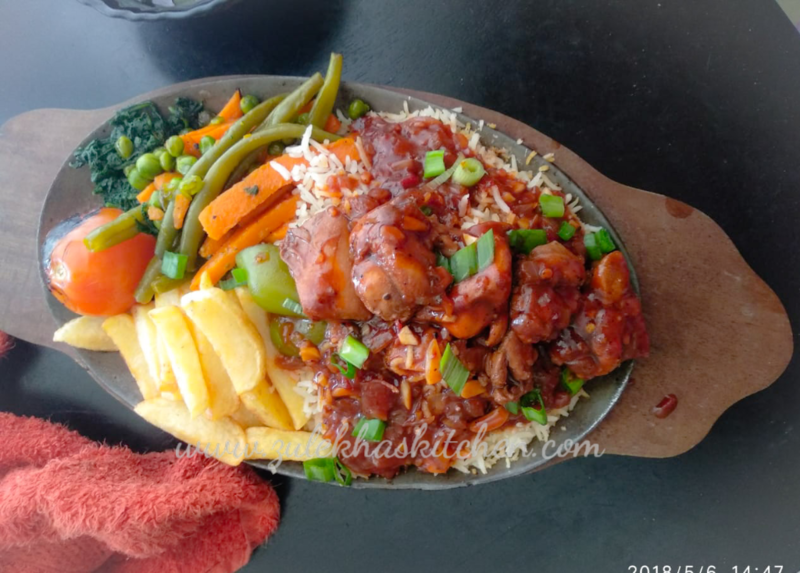 Heat heavy bottom pan , add 1 tbsp oil followed by marinated chicken and fry on medium flame for about 5- 6 minutes , flip the chicken and fry for more 3-4 minutes or until the chicken dries up (make sure you keep some thick gravy ), adjust salt and other seasonings. Off the gas . Side by side heat a coal until red , place this hot coal in between chicken pieces , and pour 1 tbsp oil / clarified butter . Cover the pan immediately to get smokey taste. 4. 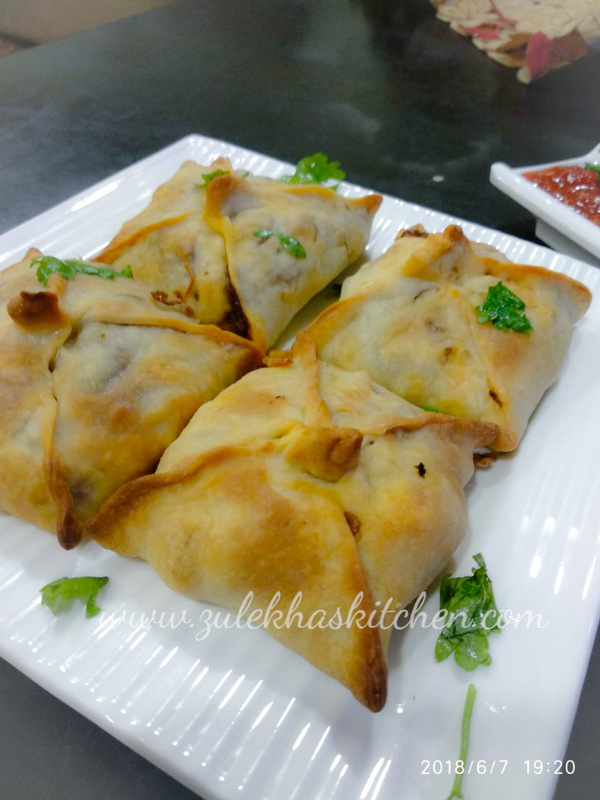 Serve with any kind of mayo dip or sauces / chutneys . PREPARATION TIME : 10 -15 Minutes. COOKING TIME : 20 Minutes and extra time . TOTAL TIME : 30-35 Minutes and extra time . SERVES : 3-4 Persons . 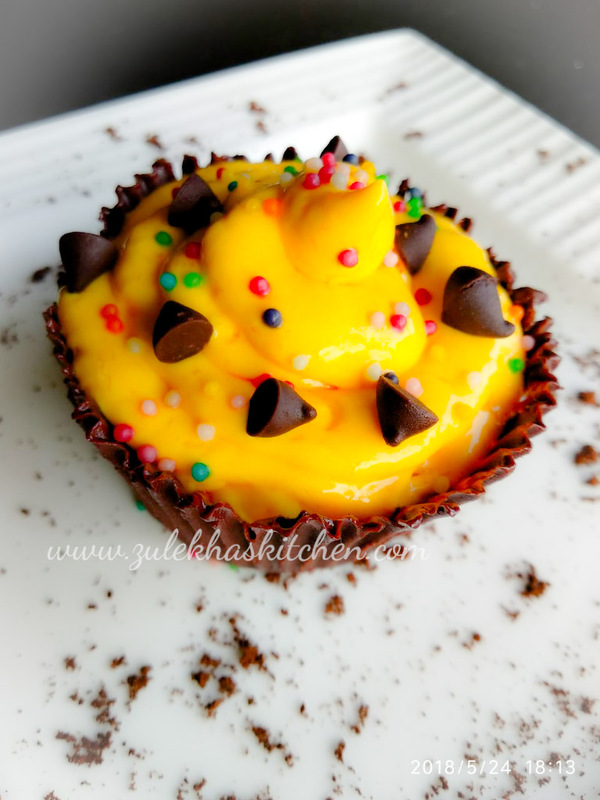 Click here Mango Mousse in Chocolate cups is not only eye pleasing but delicious in taste too. 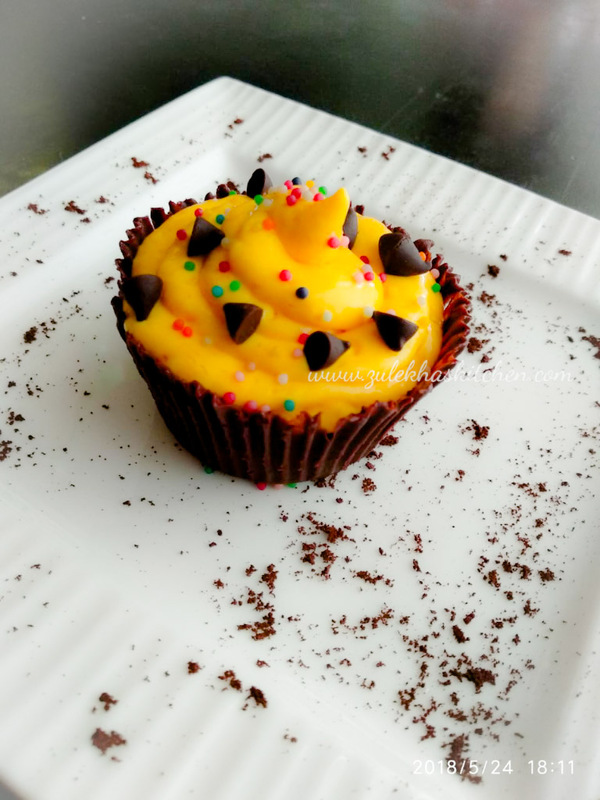 I usually make Mango with cream ( click here for recipe ) or Mango Firni ( Click here for recipe ) but this time I wanted to make something very different with superb taste , so what better one can think other than adding chocolate to mango , isin't it sounding great ....! 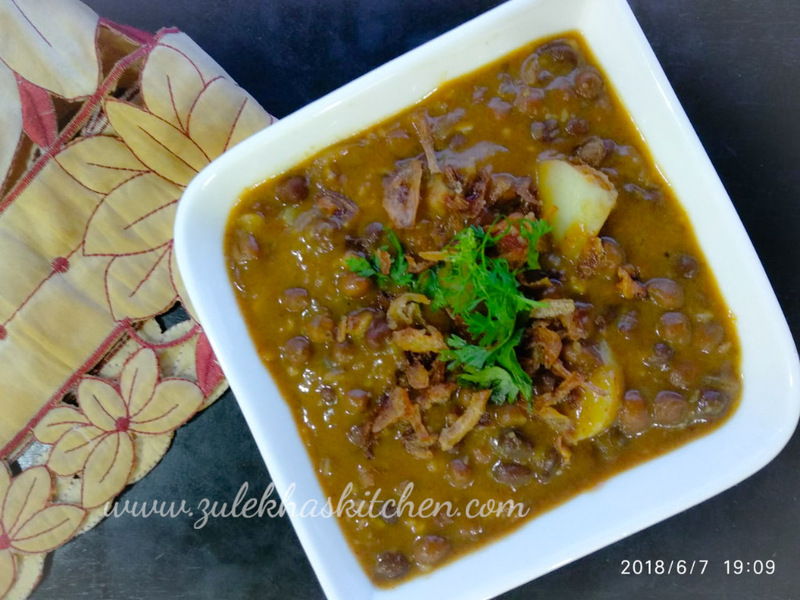 Yes it did to me and then I tried this recipe , not only my kids loved it me and my husband we too enjoyed it a lot . 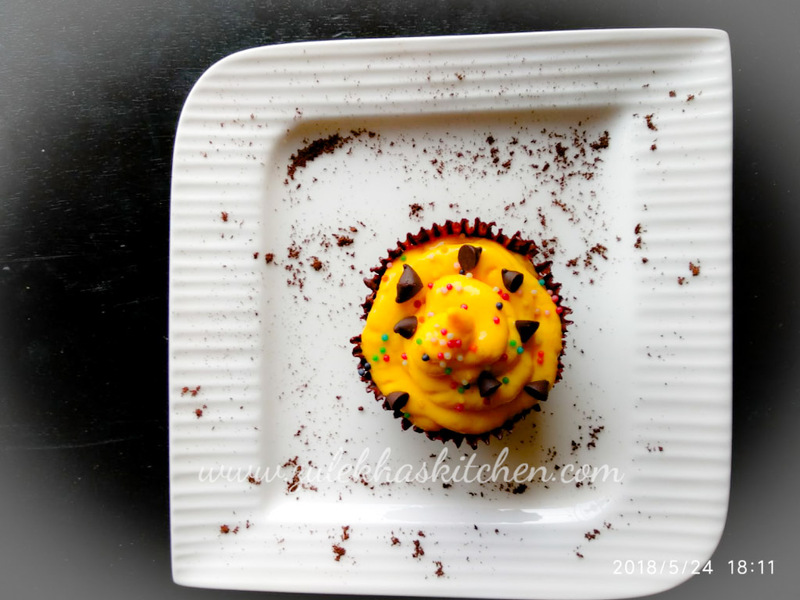 As I am a die heart lover of chocolate , many of my desserts have chocolate as an important Ingredients , if you are also a chocolate lover like me then I am sure you will definately love it. 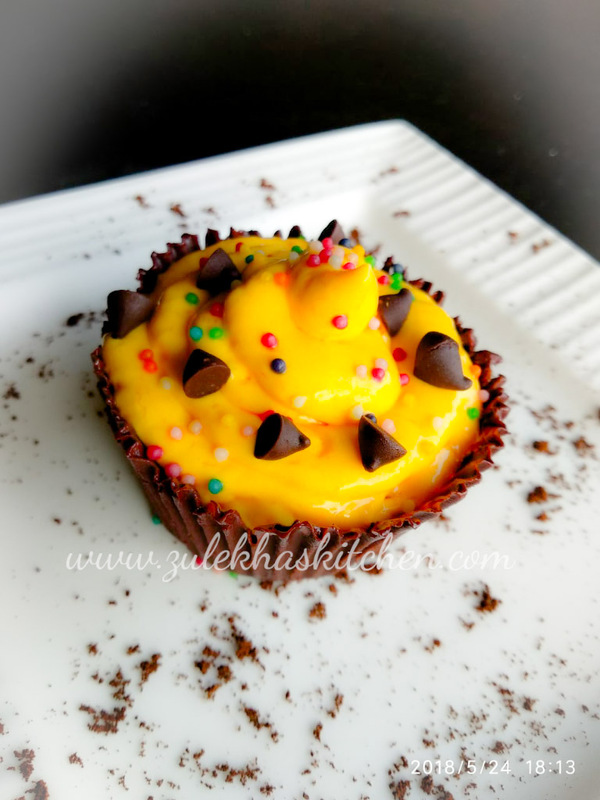 Here is my recipe of Mango Mousse In chocolate Cups. Microwave the chocolate in a safe bowl and heat for 30 seconds or until the chocolate melts completely or boil some water in a deep pan and keep a steel strainer on it , now place a small steel bowl and place the chocolate chunks into the bowl , within few seconds the chocolate will start melting , continue until the chocolate melts completely . 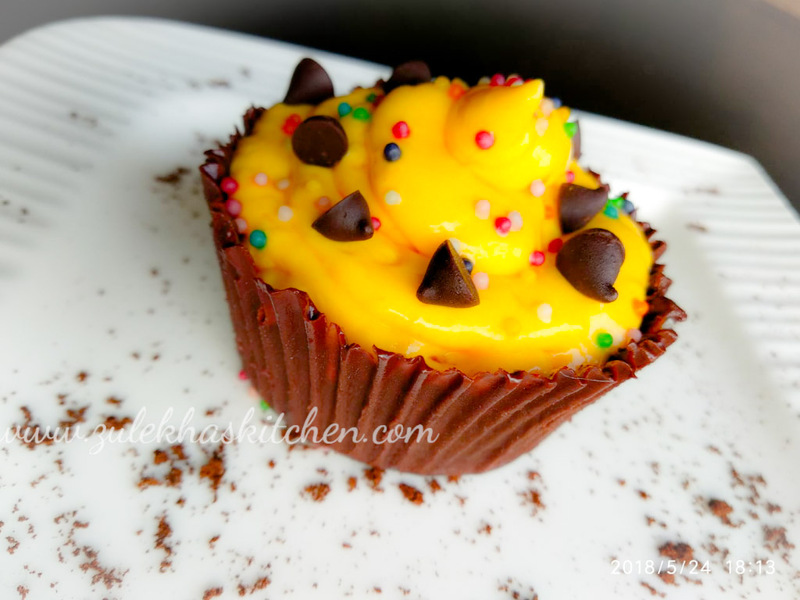 Place each cup cake liner in cupcake mould and add 1 tbsp or more melted chocolate in each linear . with the help of silicon brush , coat all the sides and base and refrigerate the liners with the mould for about an hour. Now coat each cup again with melted chocolate , this time make sure you brush up to the wall of liners and refrigerate again with the mould for an hour. Now again coat the base and side walls of each liner and refrigerate it so that you get a perfect thick coating of chocolate or else the sides will start falling off. By the time the liners are refrigerated , prepare the mango mousse . 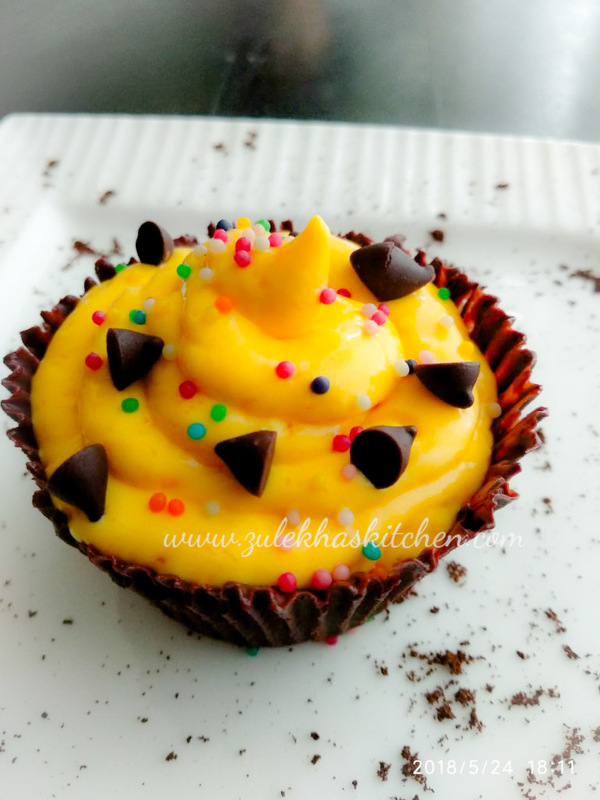 Peel the skin of both the ripe mangoes , chop into pieces , add 2 -3 tbsp icing sugar and make a smooth paste with the help of food processor . Strain the puree and keep aside , preferably in refrigerator for some time . Now heat 5 tbsp water and then sprinkle gelatin to it , let it rest for 5 minutes until it comes to room temperature. 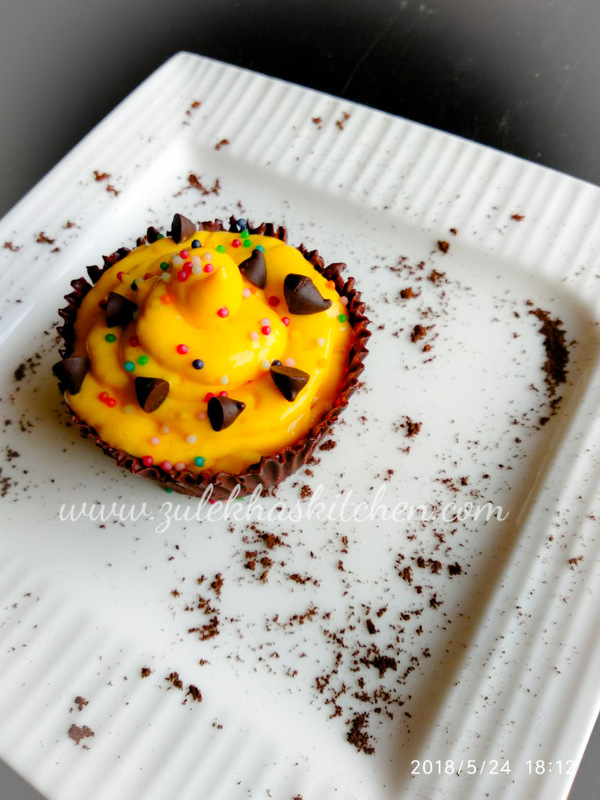 Mix this gelatin to the mango puree continusly with the help of spoon. 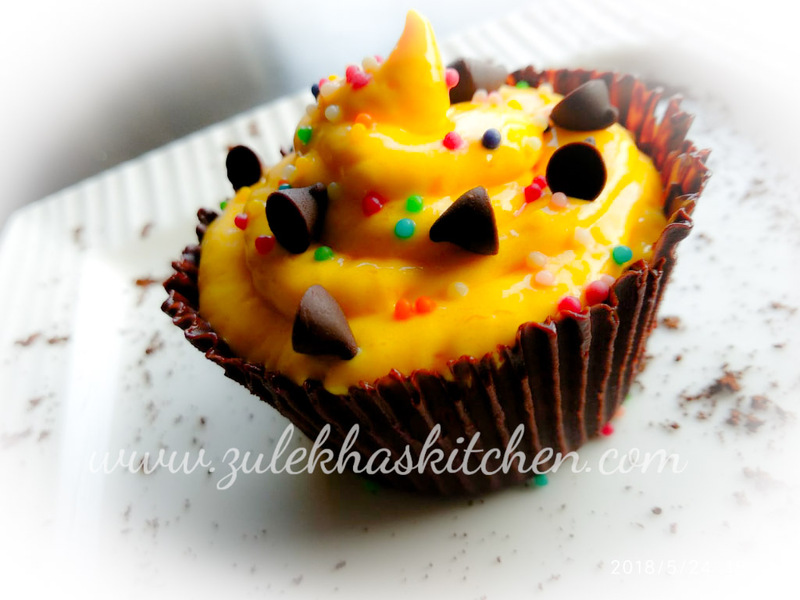 Fill the mango mousse in a piping bag and keep aside. Now carefully peel each liner from the chocolate cups. 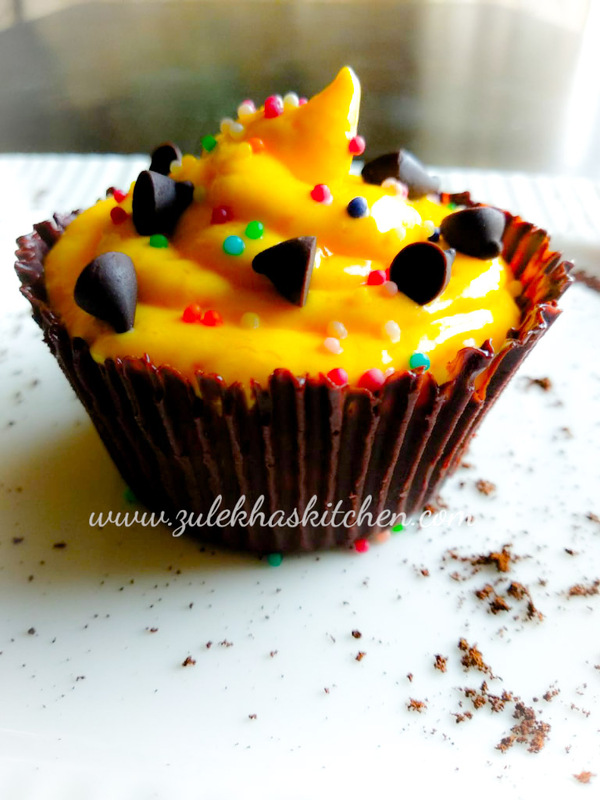 Add chopped mango to the choclate cups and then pipe each liner with mango mousse. 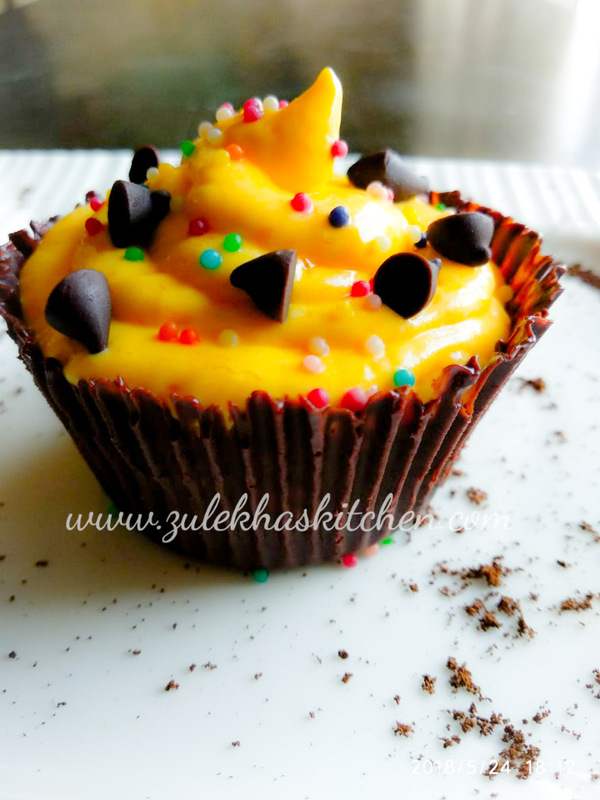 Garnish with some chocolate chips and sprinkles , refrigerate for half an hour and serve . 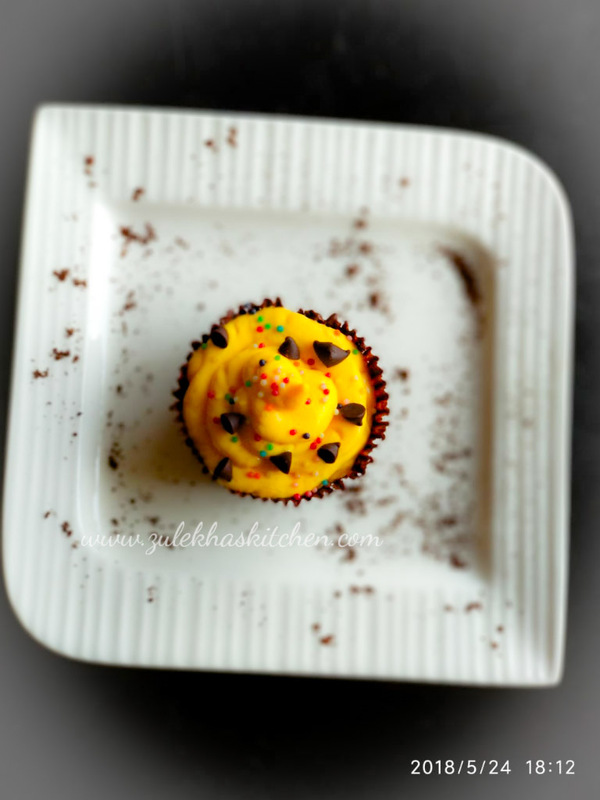 I have used tropolite cream which added sugar in it , but if you are using amul whipping cream then you need to add 2 -3 tbsp icing sugar separately at the time whisking the cream. You can use bitter sweet any cooking chocolate . 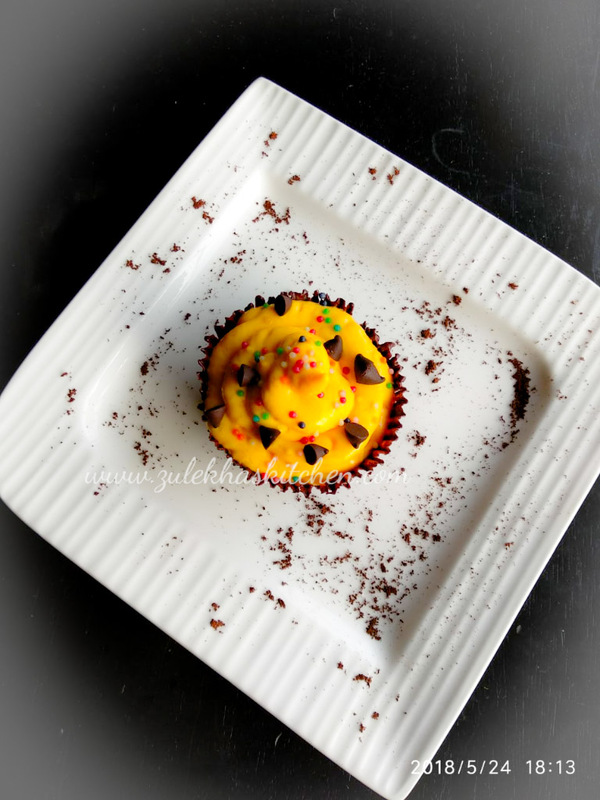 For recipe of mango with cream ( click here ). 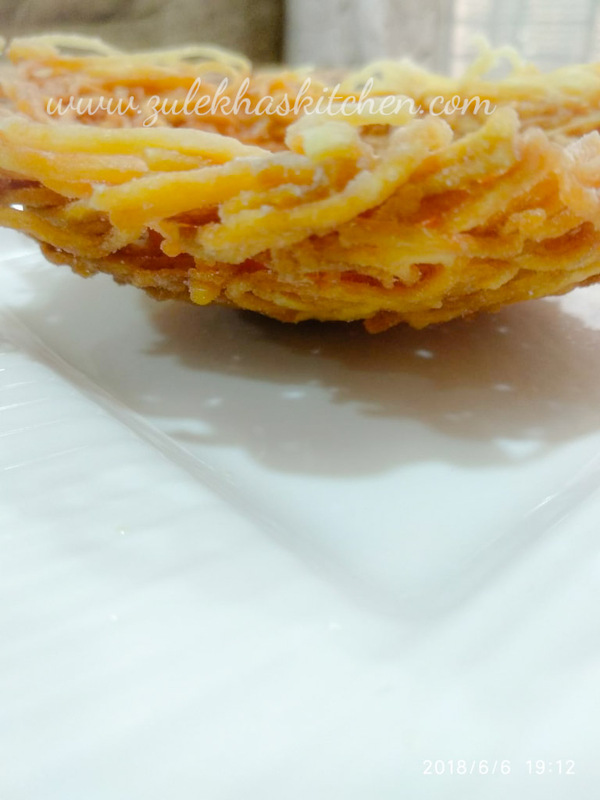 For Mango Firni Recipe ( click here ). 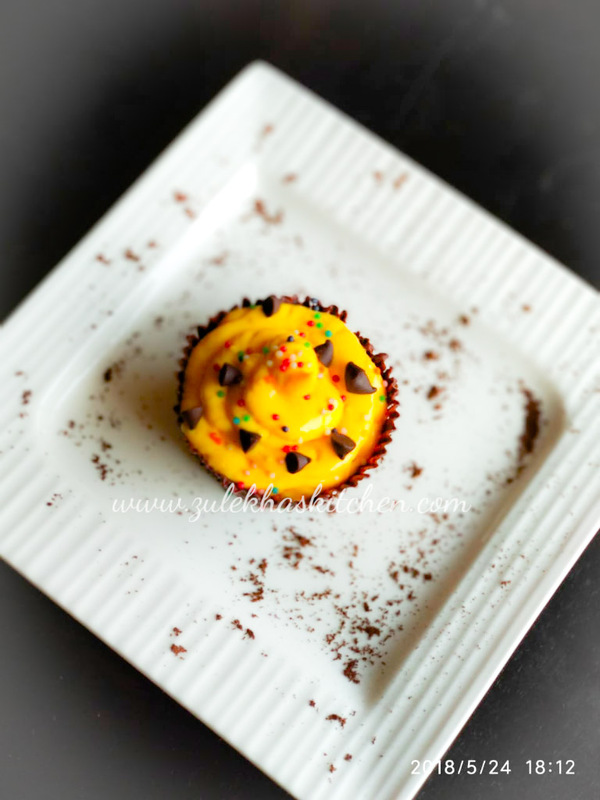 Increase or decrease the amount of icing sugar as the mango's sweetness . SERVES : 6 Persons . 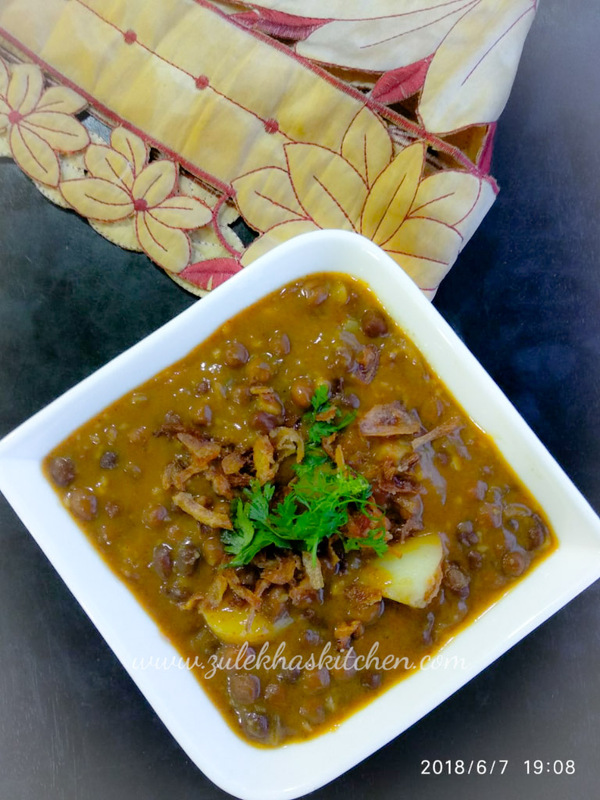 Schewan alu is a spicy, tangy and delicious chat pata snack, which can be prepared in just few minutes. 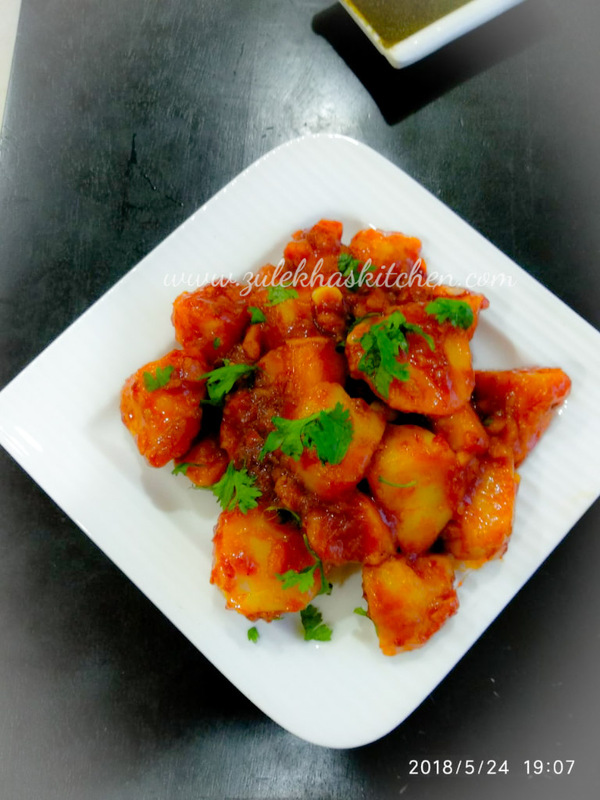 Here is the recipe of my Chat pata Schezwan Alu / Schezwan Potatoes / Chinese Potatoes. Boil potatoes , drain for sometime and peel . Chop into small or medium pieces , keep aside . In a pan , drizzle some oil , add garlic and fry for a minute but make sure it doesn't turn the color. Add schezwan sauce, soya sauce, vinegar and tomato sauce ( ketch up ) , mix everything well. Add chopped potatoes and mix well . Adjust the seasonings. If you think its too spicy then add more tomato sauce. Its best when made with home made schezwan sauce. You can add red, yellow and green bell peppers too. 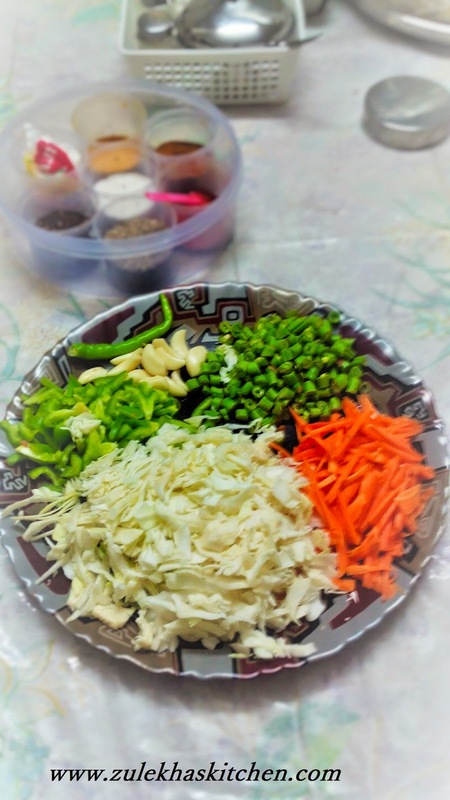 You can even add spring onion bulbs at the time you add garlic and then garnish with spring onions stem ( chopped ) instead of garnishing with coriander leaves. 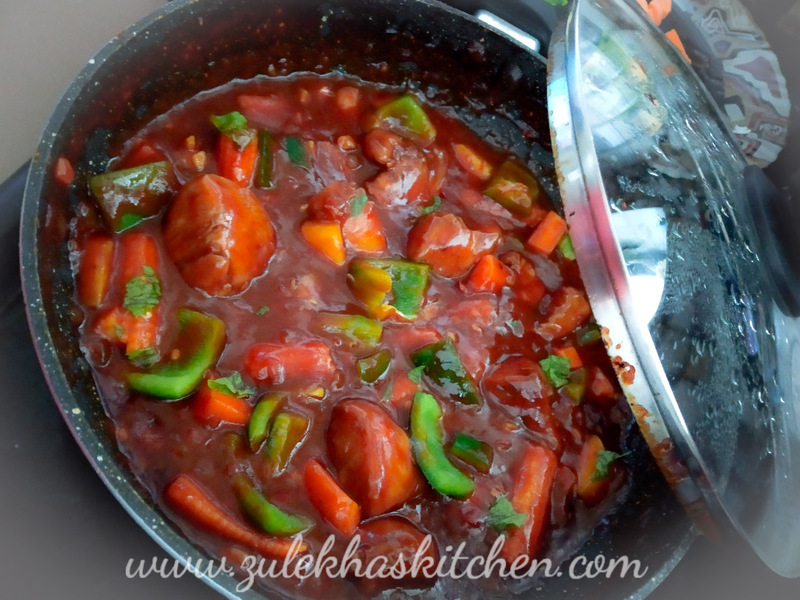 If you are adding thickly chopped red, yellow, green capsicums, make sure you add peppers after you fry the garlic. PREPARATION TIME : 10 Minutes . COOKING TIME : 10 Minutes . TOTAL TIME : 20 Minutes . SERVES : 2 Persons . 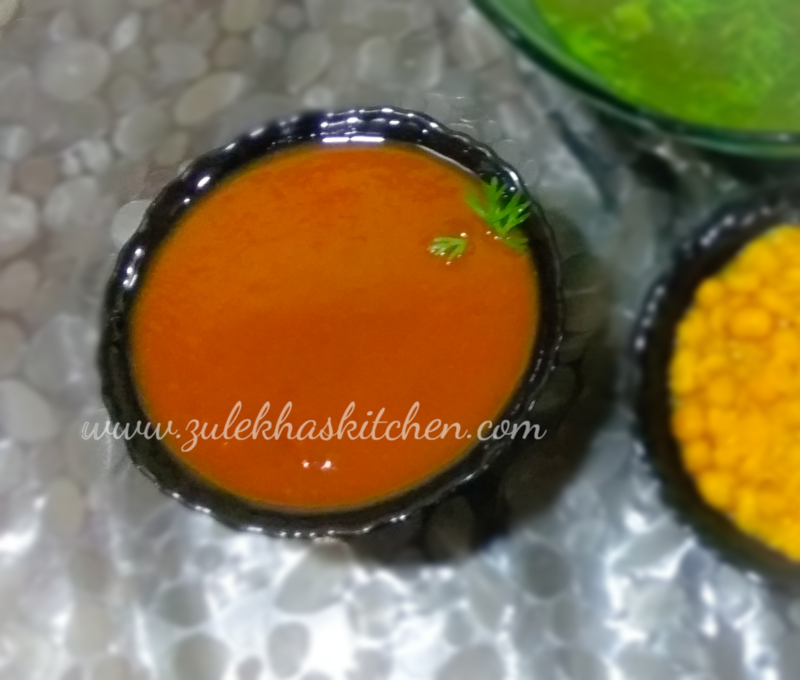 Meethi Chutney for Pani Puri / Khajoor chutney / sweet Tamarind Chutney is a balanced and delicious chutney served with spicy pani ( water ) of pani puri and boiled chic peas . 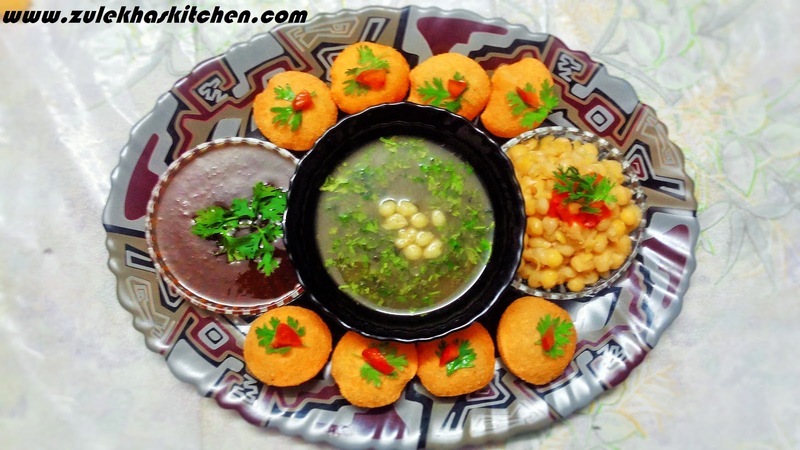 Here is my recipe of Meethi Chutney served with pani puri 's Pani ( water ) . Remove the seeds and soak tamarind in 1 cup of water . After sometime squeeze all the tamarind and form a thick pulp of it . In a pan , add seedless dates with 2 cups of water and tamarind pulp , cook for sometimes till the dates get soft . Once the dates are soft , add salt , red chilly powder , coriander powder , cumin powder and jaggery . Cook for 4- 7 minutes , adjust salt and jaggery if needed . Strain the Tamarind / Meethi chutney through a strainer . 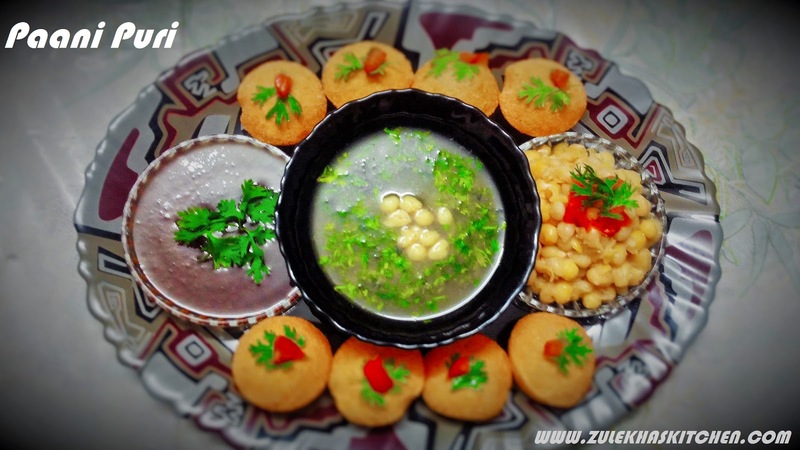 Serve with pani puri or any kind of chaat . You can store Tamarind Chutney / Meethi chutney in an air tight container and refrigerate it for further use . COOKING TIME : 10 -15 Minutes . TOTAL TIME : 20 -25 Minutes .